Birds are easy to watch. They are everywhere, even on high-rise downtown buildings. 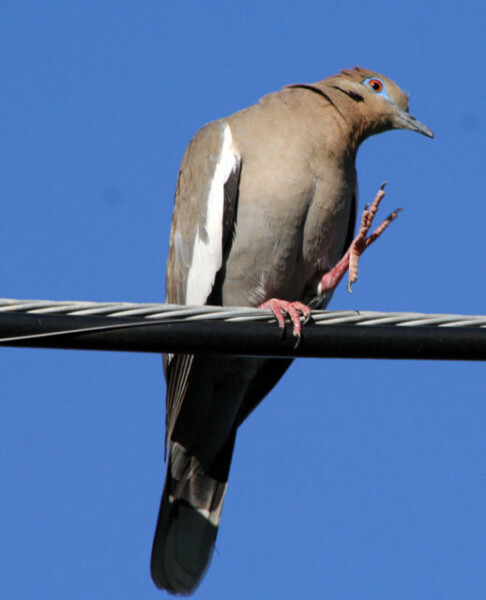 Even the most common birds exhibit fascinating behavior. 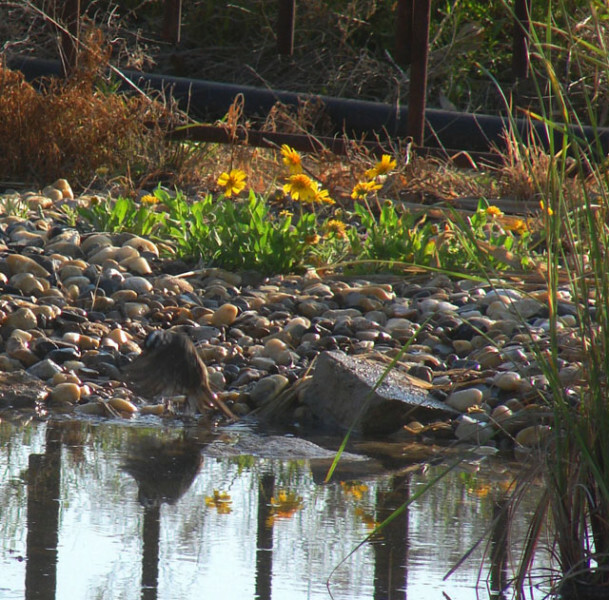 The following photographs were taken by over twenty volunteers for the Sibley Nature Center. 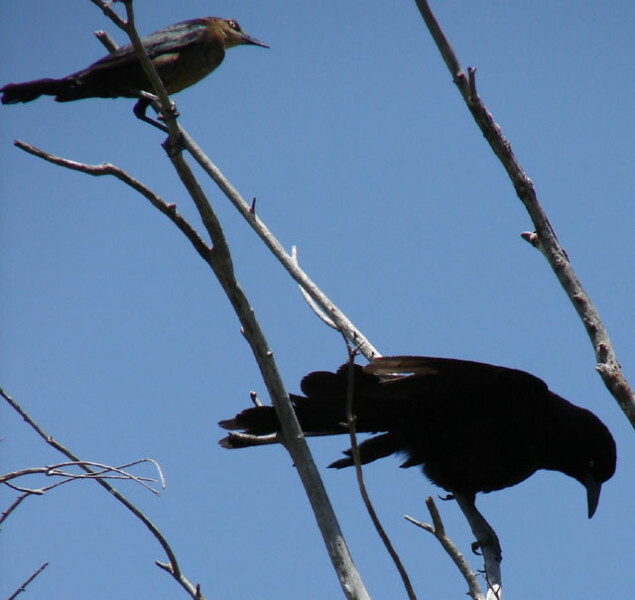 Grackles and other birds often hang out near mammals for two reasons. 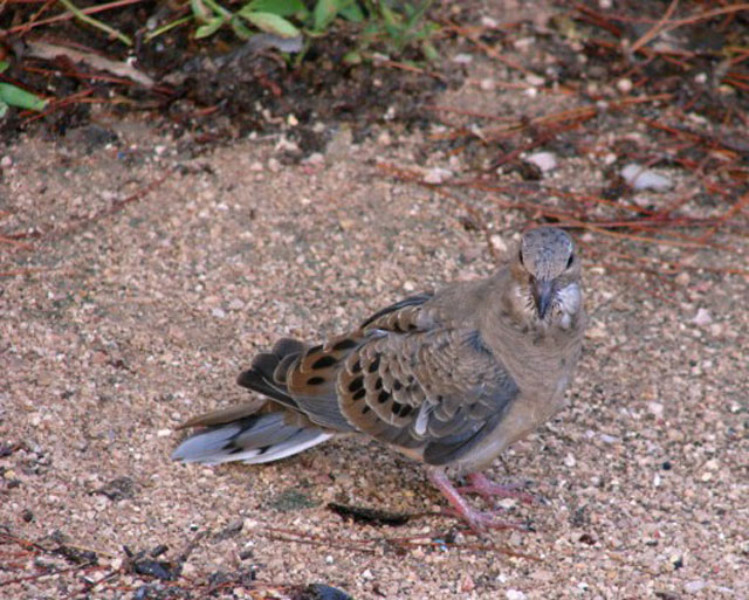 First, the mammal may disturb an insect for the bird to catch. 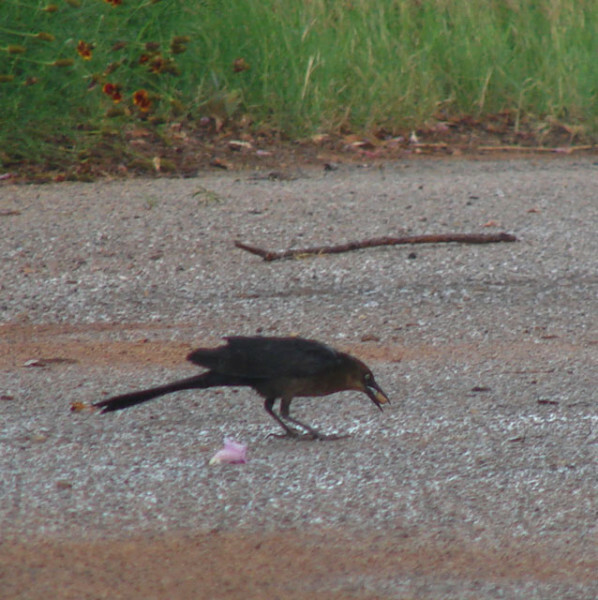 Second, grackles will sometimes dig through animal droppings for unprocessed seeds. When it is hot, birds shed excess heat by "gular panting," opening their beaks and panting. Birds do not have sweat glands. 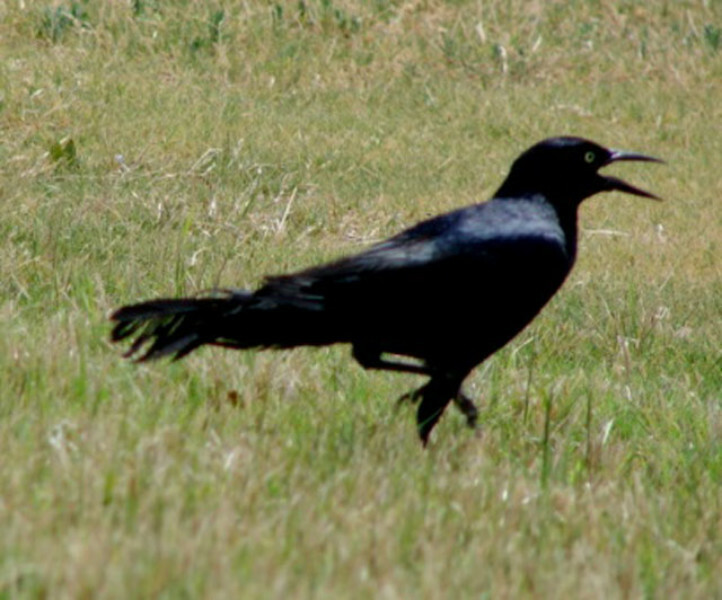 During breeding season, male grackles strut around the females and attempting to bluff other males away from females. 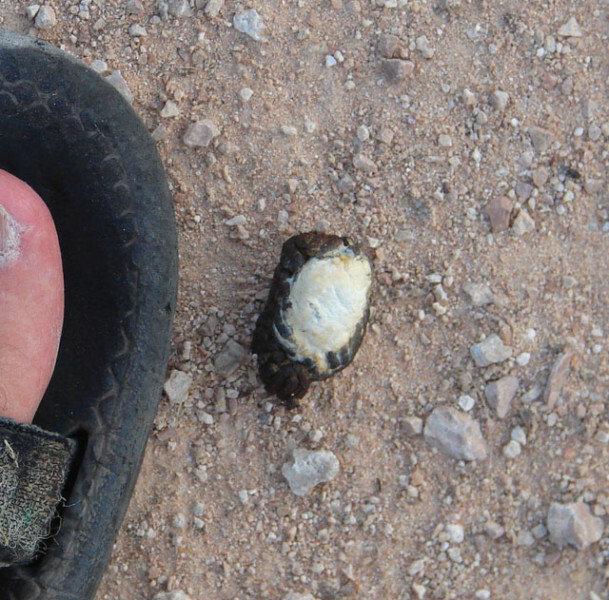 Female birds of many species remove the feces of the young from the nest and carry the droppings far away, so a predator can not locate the nest. 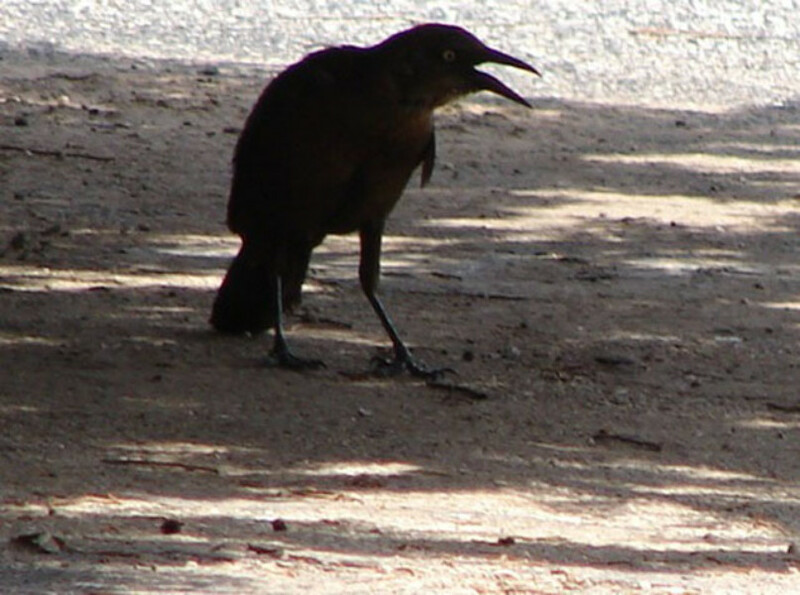 Grackles are curious birds, often picking up items to determine if they are edible. This one has picked up the cap to an acorn, but it put it right back down. Sometimes birds perform behaviors that are hard to understand. 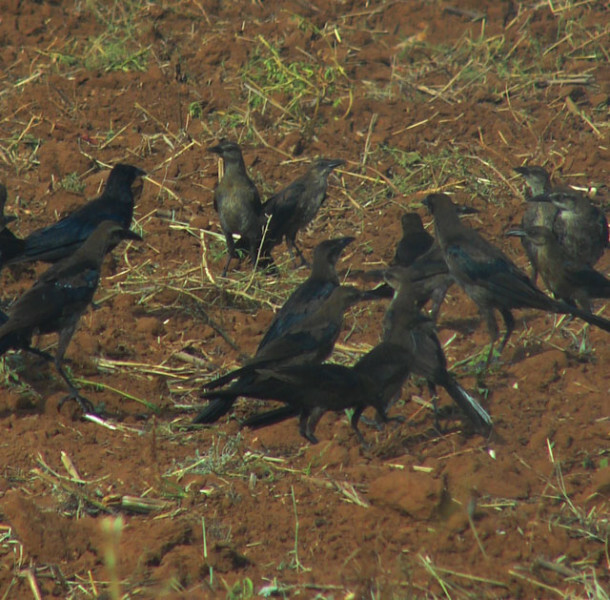 Here, a group of grackles formed a circle. Many of the birds were quivering, and sometimes pointed their beaks to the sky. Most appear to be immature birds in the photograph. 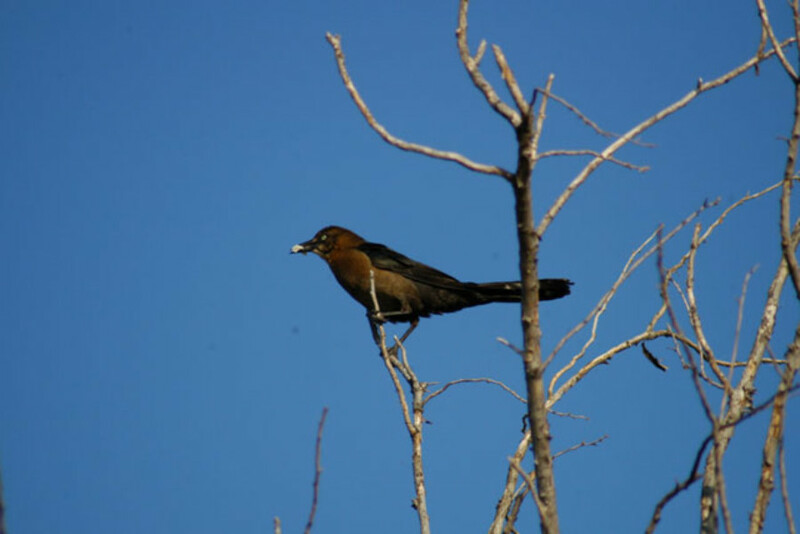 A male grackle screeched at something hidden in the marsh where the female had a nest. The female stayed behind the male as it swooped into the cattails several times. 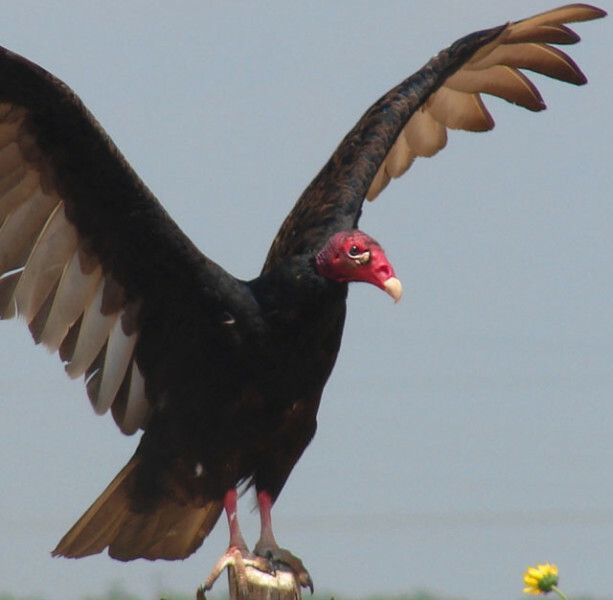 Turkey vultures are in Midland County from April to October, and then migrate south for the winter. 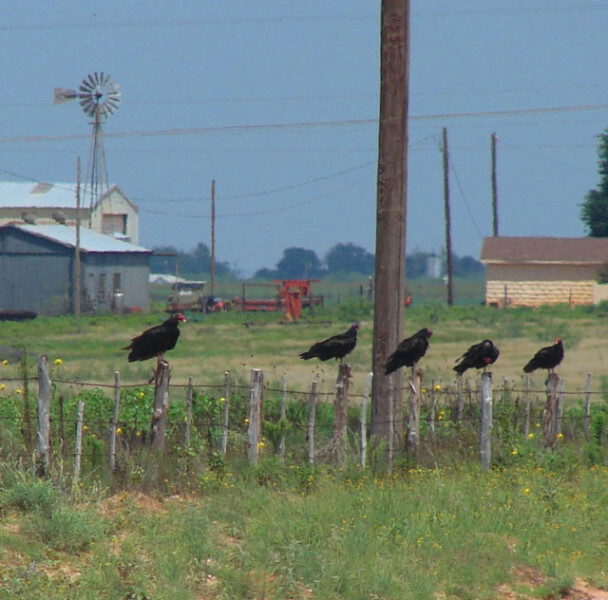 Vultures often sit on fence posts in the morning, warming themselves in the sun. Spreading their wings warms them faster. 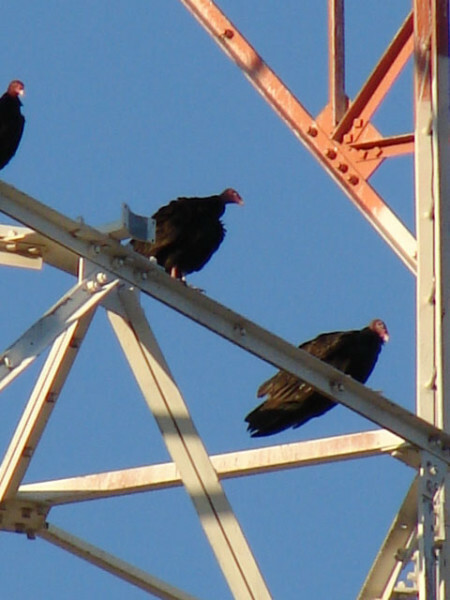 Turkey vultures will roost together at night after nesting season, usually in trees, but on the plains fences sometimes have to suffice as night time perches. 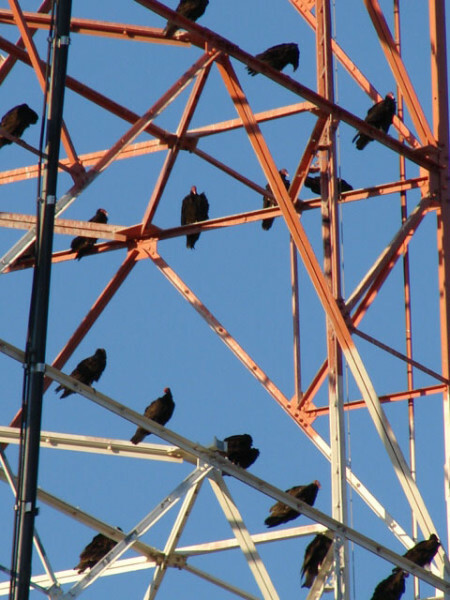 A tall communications tower held over 150 vultures one evening. The birds did not settle down immediately. 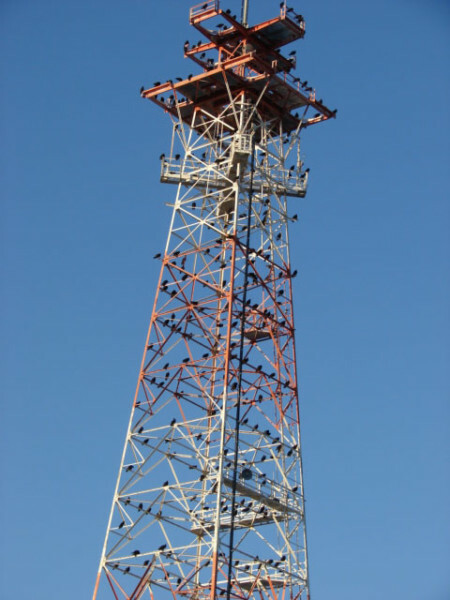 At times one would fly away, soar around, and then come back to another rung on the tower. As the sun set, the birds began to settle down, but they continued to watch each other intently. 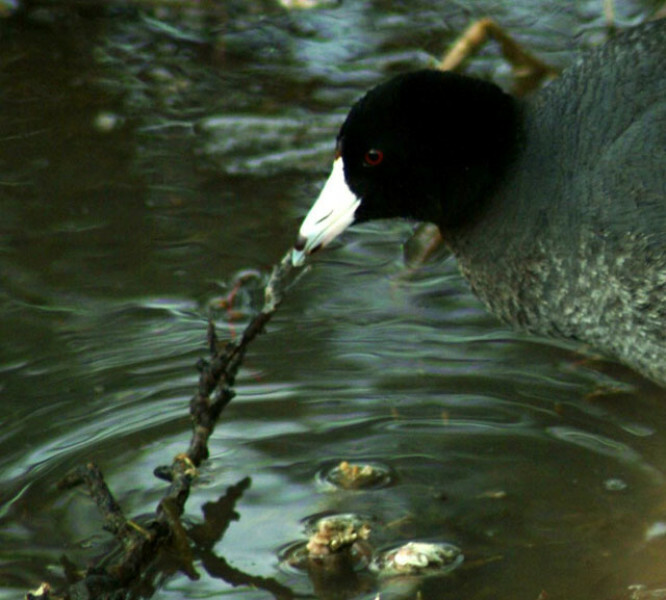 American coots are water birds that nest in cattails. 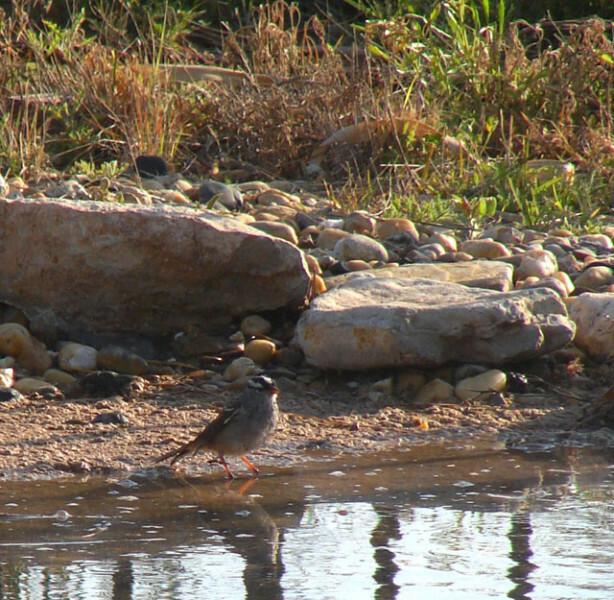 They often walk around on land, looking for seeds and insects. 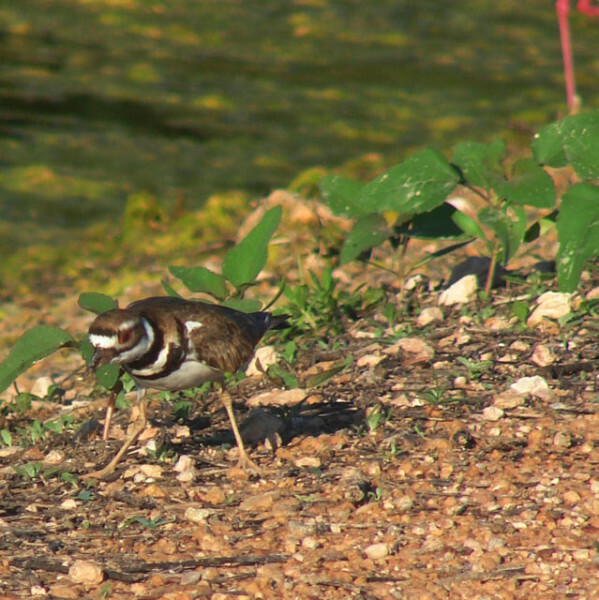 At times several birds walked together in a "beat line," as if to cooperatively flush grasshoppers or other insects. At other times they wandered aimlessly. One, then two, approached the photographer within a few feet. Two birds spotted a food item at the same time and almost butted heads. 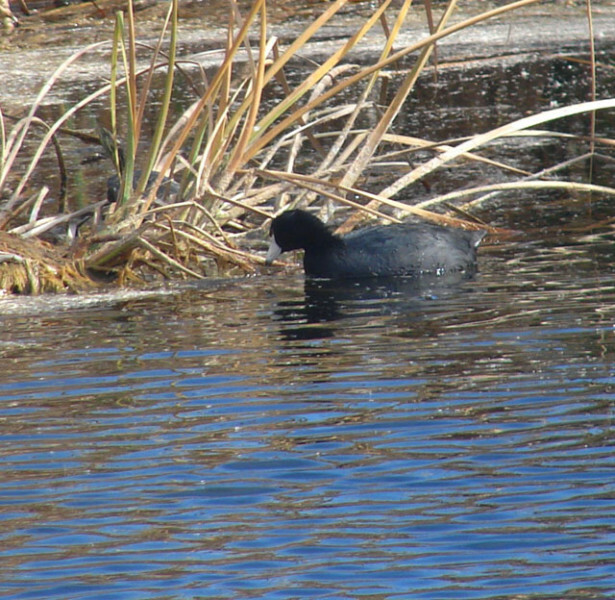 This coot stood at the edge of the water, dipping its head and taking gulps of water to drink. 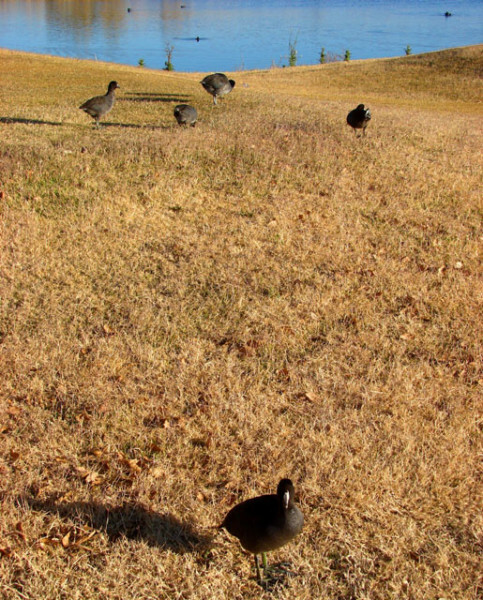 A few days after a playa filled with rainwater coots appeared. 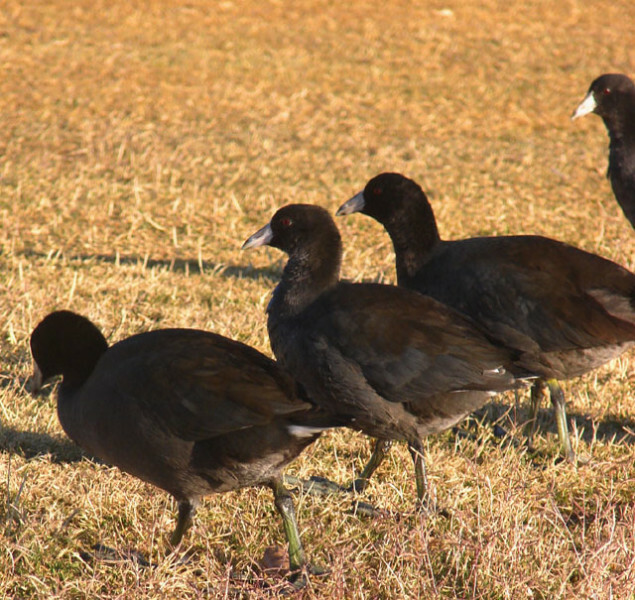 Why the coots left their home marshes at golf courses is unknown, but millions of fairy shrimp, tadpoles, and aquatic insects also were present. 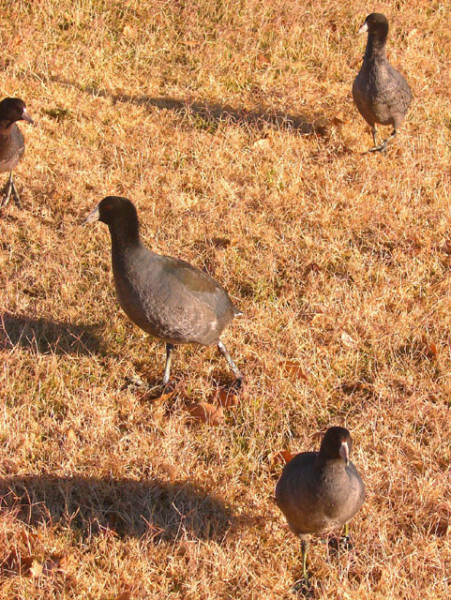 It may be that playas are rich feeding grounds and the coots have learned to disperse to playas after big rains. 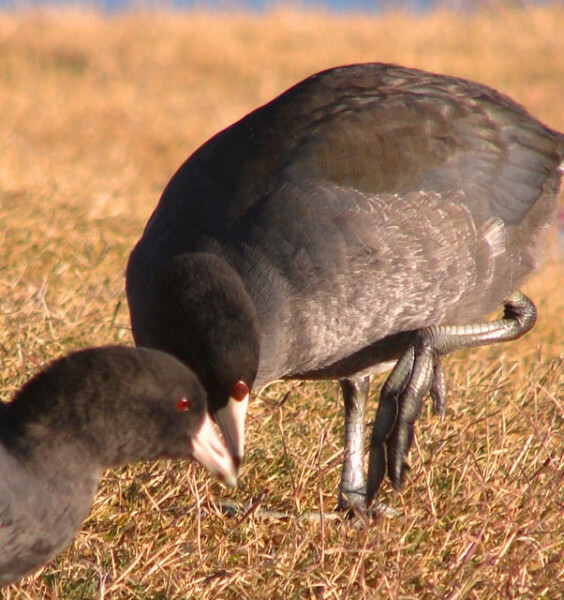 In the fall, the coots were again common at the golf course ponds. 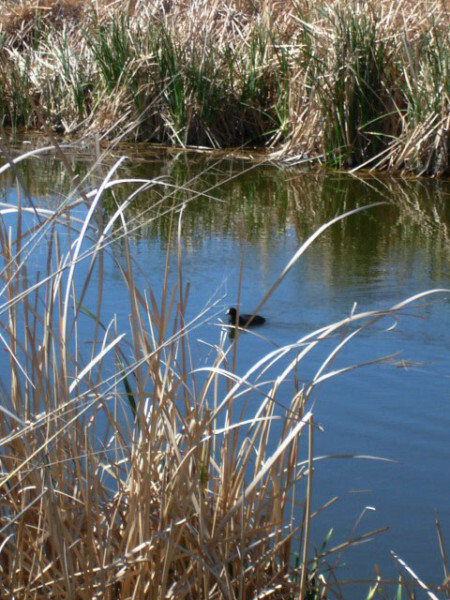 Cattail seeds covered the slack water of the ponds, but the coots did not feed on the small seeds. Some of the cattails had collapsed, possibly due to turtles eating the roots. 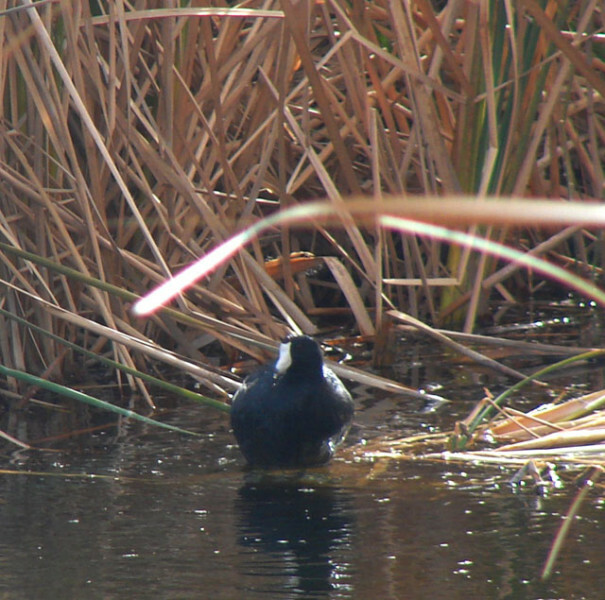 Despite the cattail stalk being a few inches under water, this coot took a standing rest after swimming for a while. 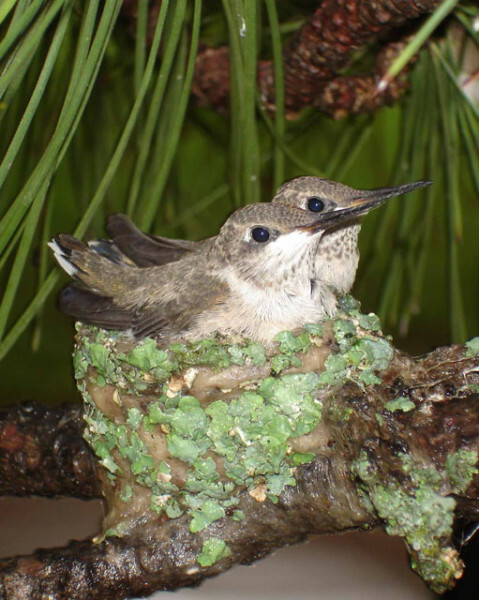 A former resident of Midland now residing in Oklahoma recorded one of the first black-chinned hummingbird nests in his home region. 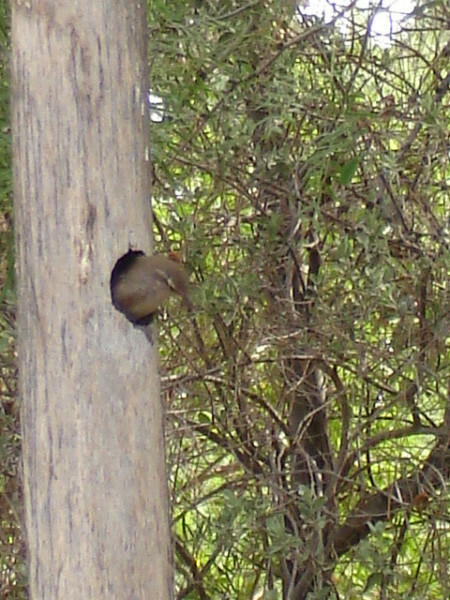 The species nests in Midland, too. First came the eggs. The babies barely covered the bottom of the small nest at first. Within a few days they filled the nest. 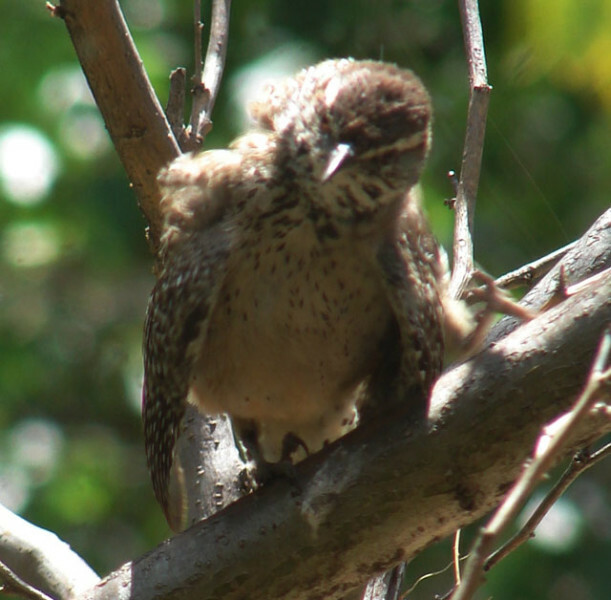 Just before they fledged and flew away, they were too big for the nest. 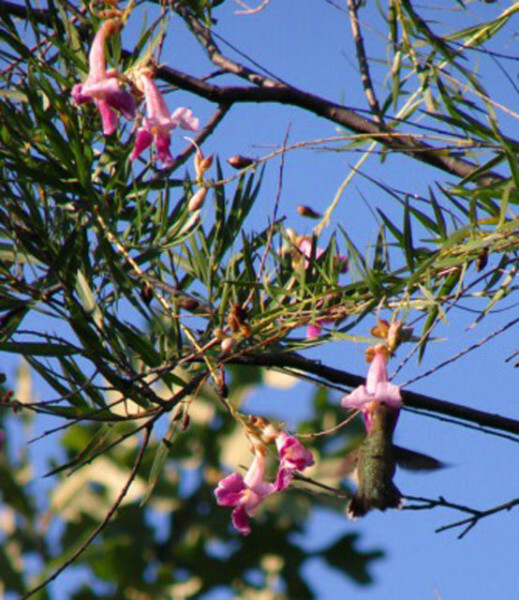 Several species of hummingbirds migrate through Midland. The "forked" tail of this one identifies it as a Ruby-throated Hummingbird. 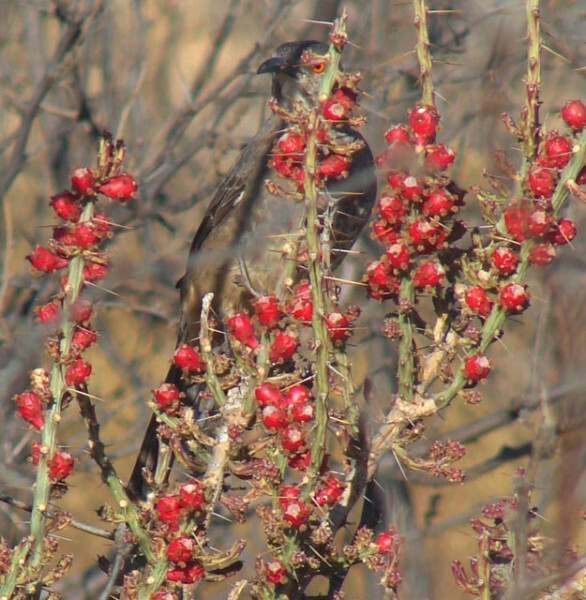 It crammed its head into the Desert Willow bloom to feed. 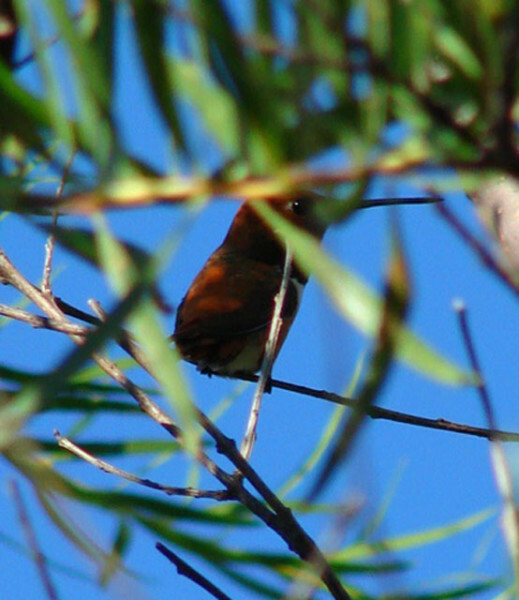 A Rufous Hummingbird appeared the next day and chased away every other hummingbird that came to feed. It lurked on an interioir branch when not feeding, waiting for other hummers to foolishly approach. 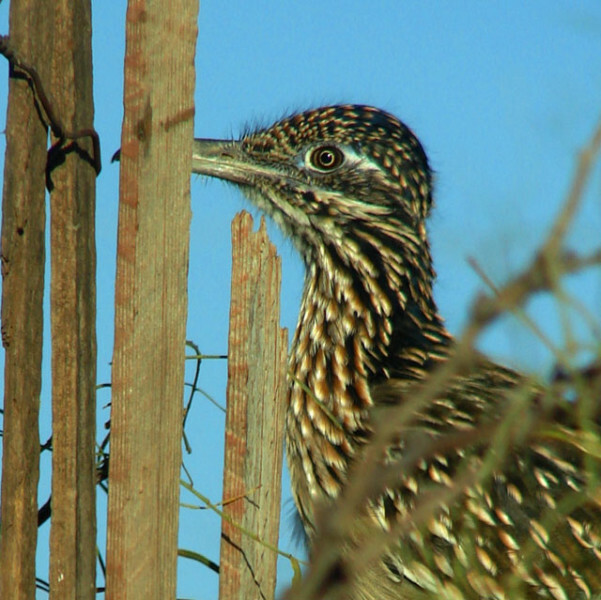 When this Roadrunner spotted the photographer it performed "displacement" behavior. It pecked at the ground, as if it was finding something to eat, but it kept an eye on the photographer. 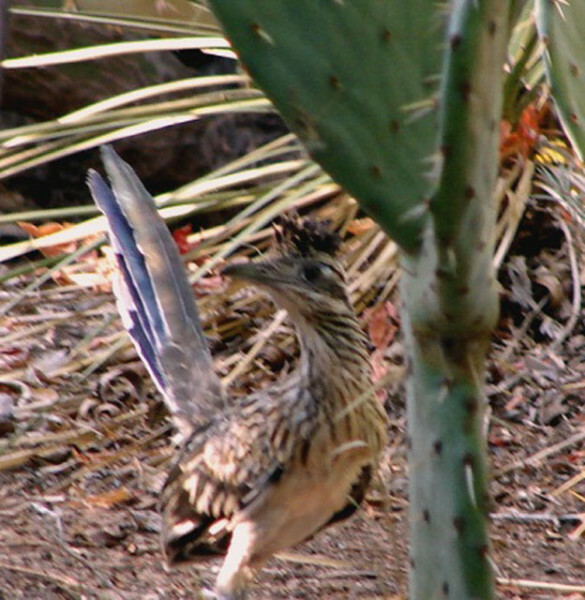 On colder days, roadrunners spread their wings and back feathers, and let the sun hit their black skin to warm them up. 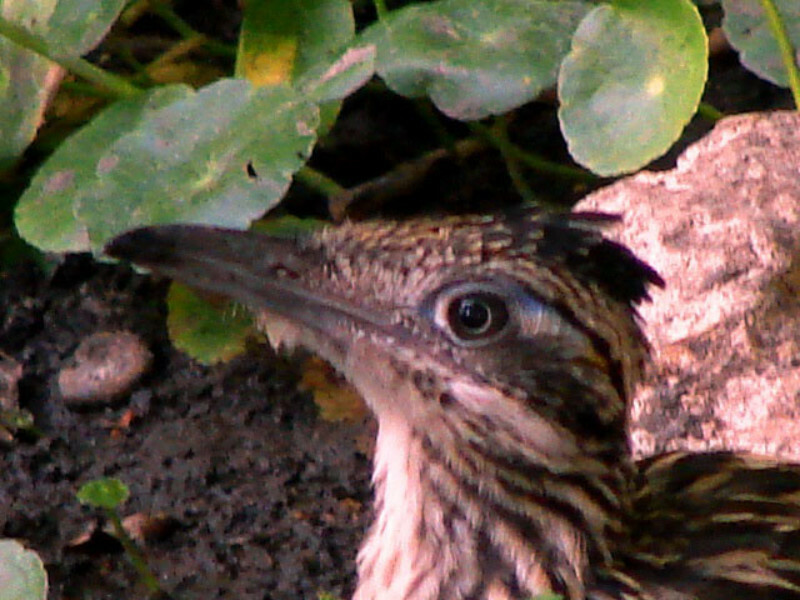 This roadrunner came to get a drink at the pond, coming within 10 feet of the photographer. It was aware of the photographer, for its crest was raised. 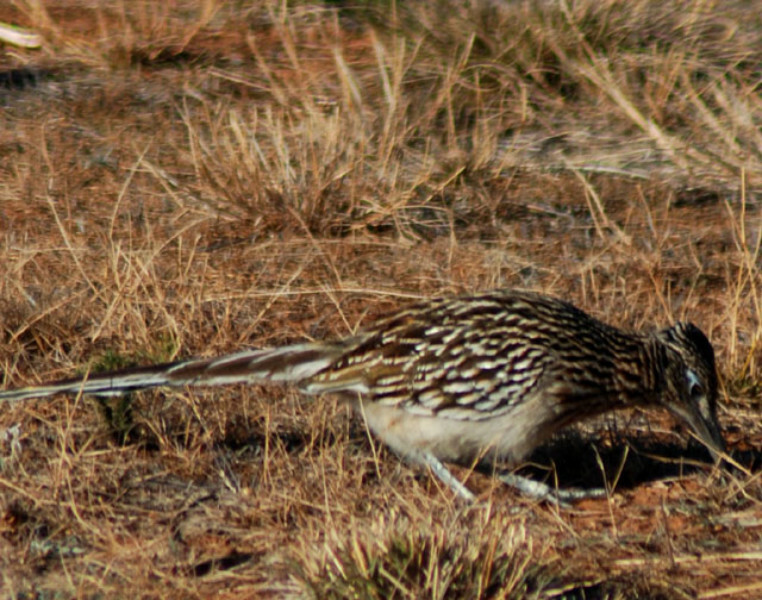 This roadrunner "hid" from the photographer, sprinting from place to place, and then peering at the photographer. 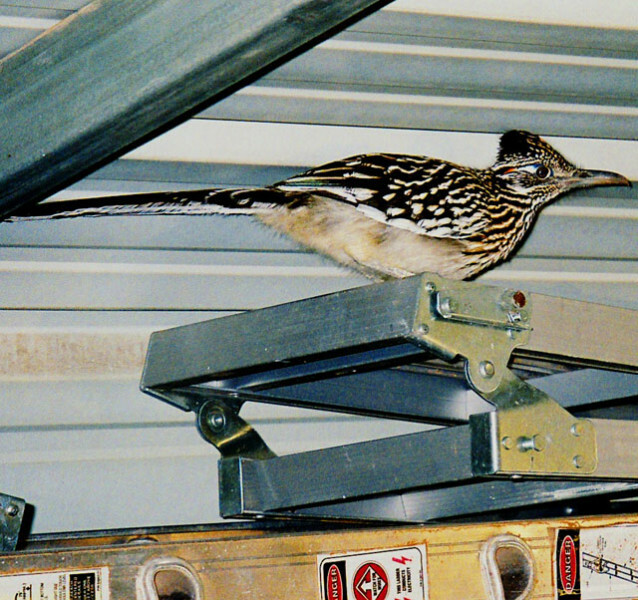 Some roadrunners are fearless, coming into garages and barns to sleep at night. 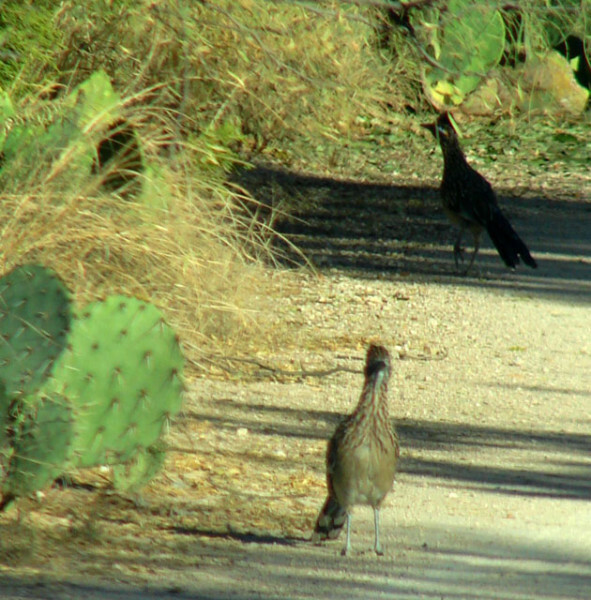 Sometimes two or more roadrunners will hunt together. These are siblings born in the year the photograph was taken, and they were seen together off and on for over a month before one disappeared. It might have been eaten by a predator, or it decided to find its own hunting territory. 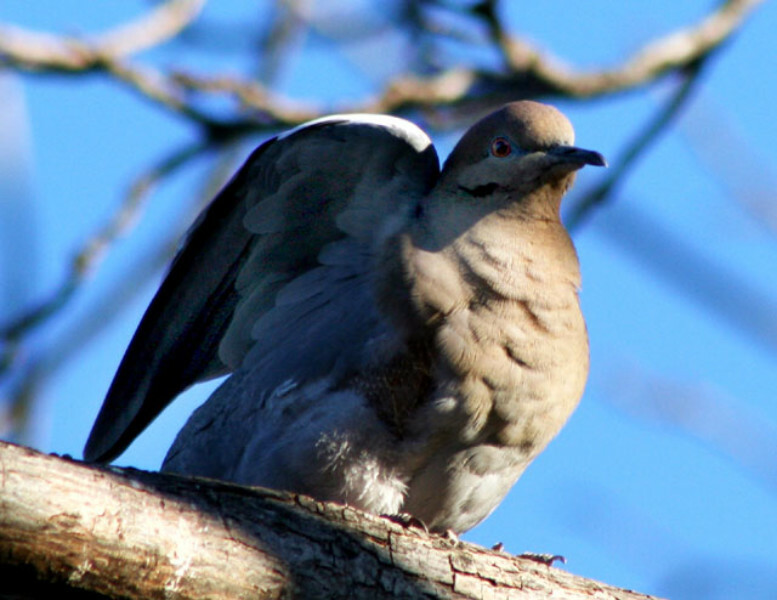 This mourning dove flitted its wings when the photographer approached too closely. After a couple of "flits," it suddenly took off, its wings "whiffling" loudly. 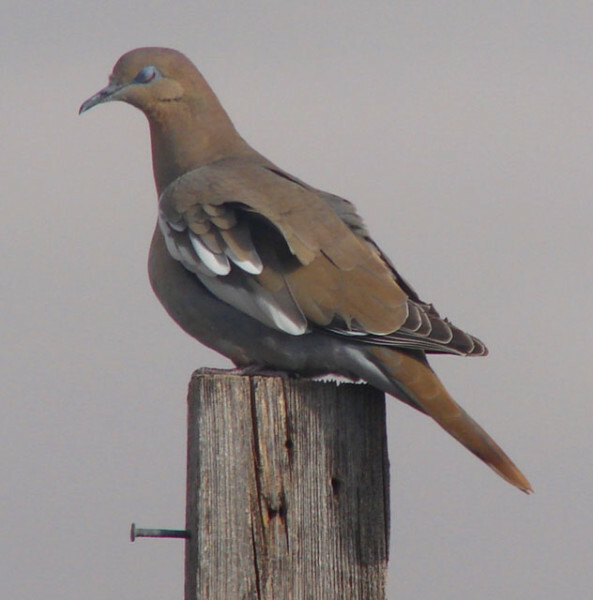 This whitewinged dove sat on a post during a sandstorm, the wind ruffling its feathers. When stronger gusts hit, it closed its eyes. 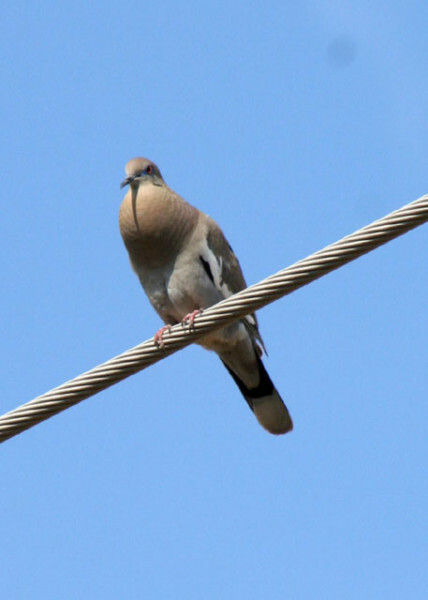 As this whitewinged perched on the electric line, it sounded out its "who cooks for you" call. Notice its chest swelled out with the effort of singing. Birds often have to scratch when they have an itch. Every bird has mites and other parasites that live in its feathers. 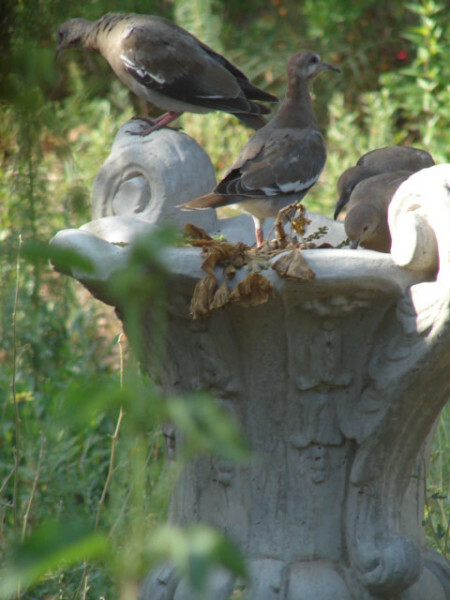 Doves often feed together, and this garden urn had previously held a flower that produced many seeds. 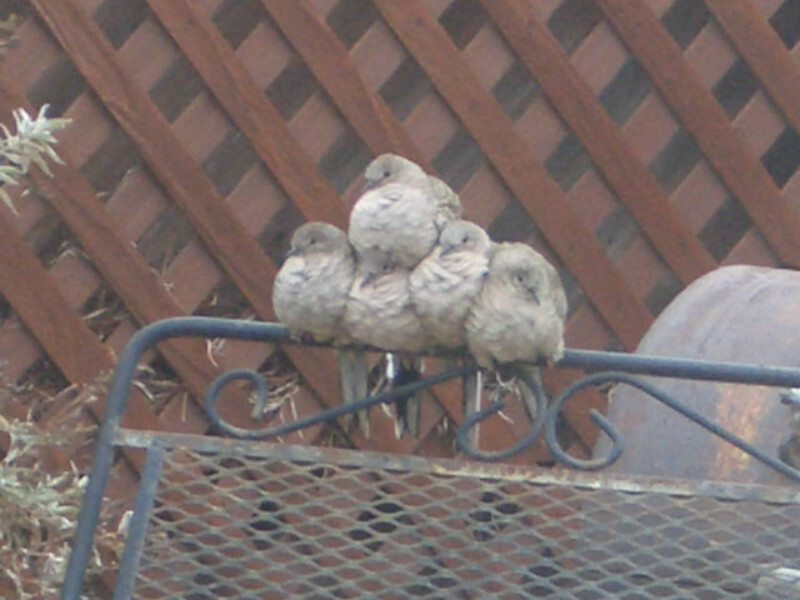 Sometimes as many as six doves crowded on the urn. 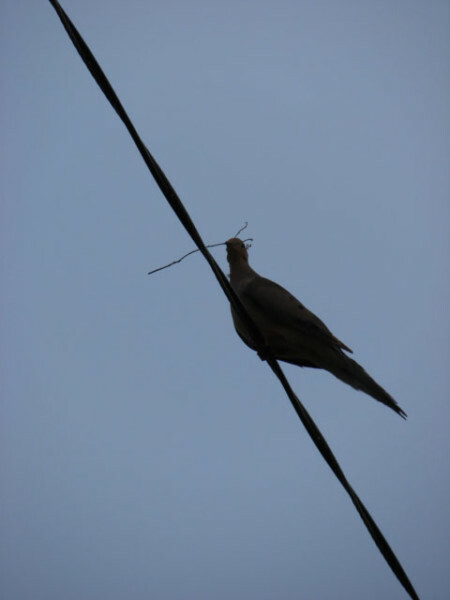 Doves make simple nests with sticks. 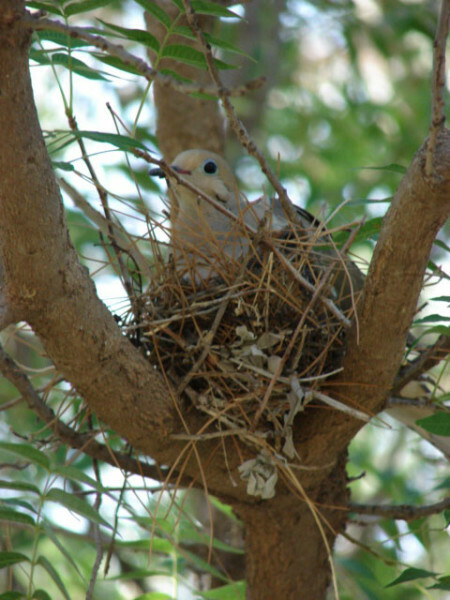 A mourning dove's nest is the flimsiest. 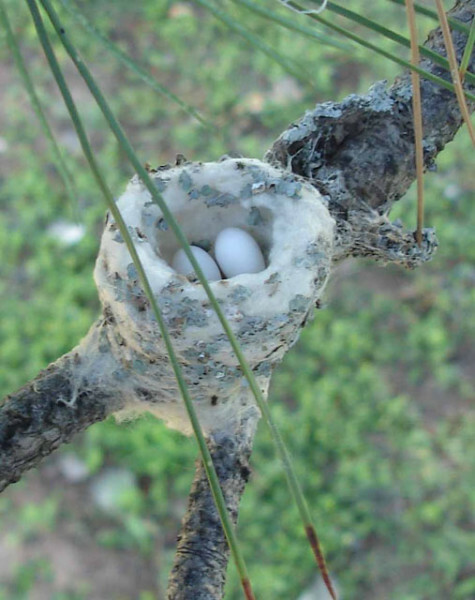 If the bird was not in the nest, a person could see the eggs through the bottom of the nest. 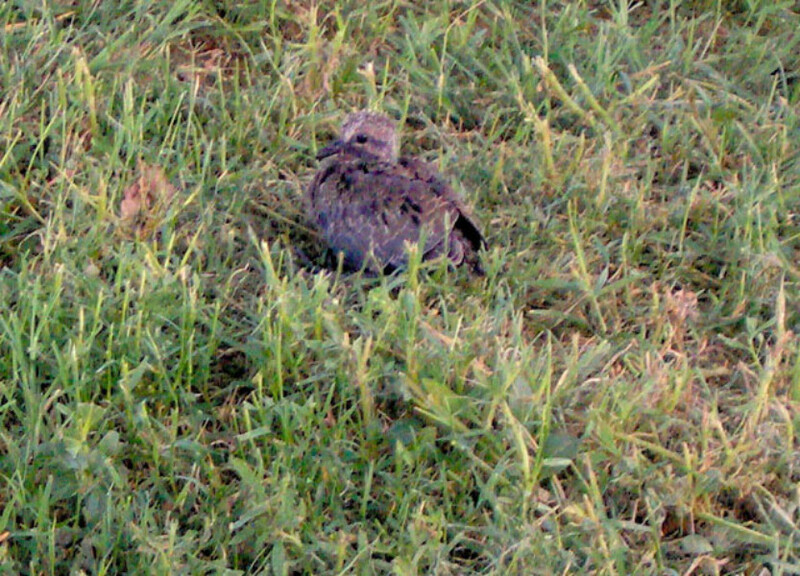 Young doves often leave the nest before they can fly, but this one was too young to do it on its own. It had been blown out of the nest, which had been destroyed by a thunderstorm. Young birds have not learned to be scared of strange objects. It walked up on a photographer kneeling on the ground photographing ants. It finally flew when the photographer stood up. 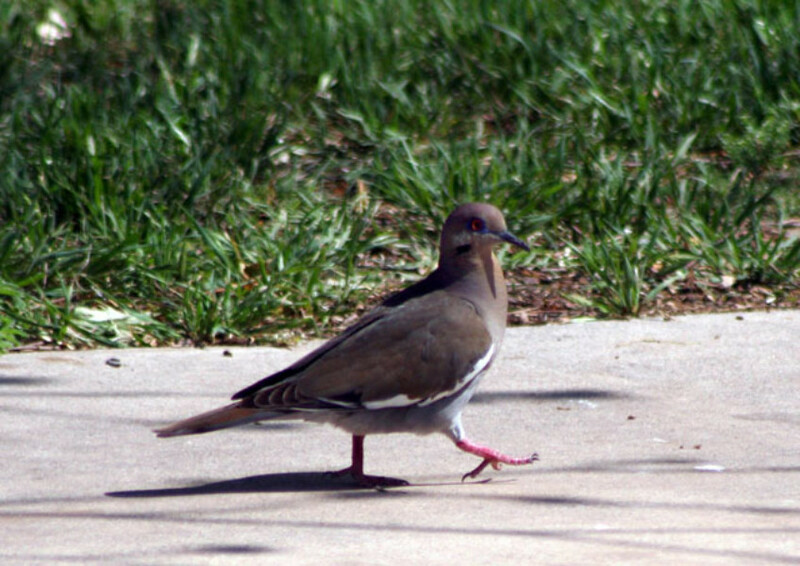 Inca doves only live in towns in West Texas, not out in the mesquite pastureland. On cold nights they huddle together, sometimes even standing on top of each other to stay warm. 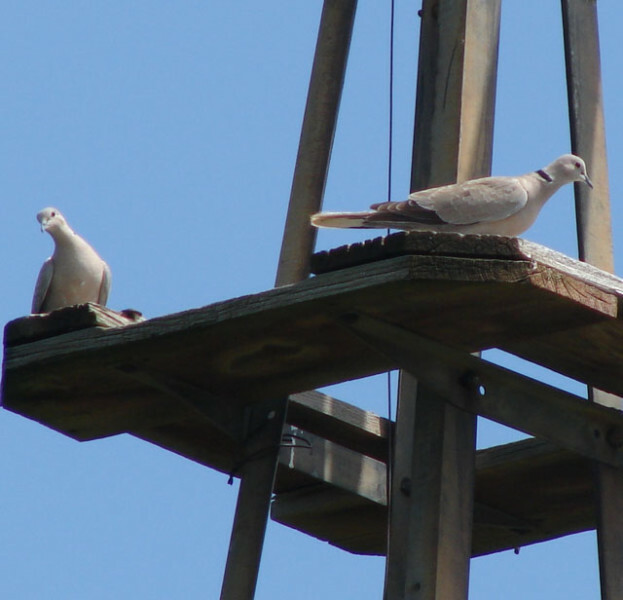 Eurasian collared doves moved into the region around the year 2000. In twenty years time they spread over most of the southern United States from the original population of escaped cage birds in Florida. 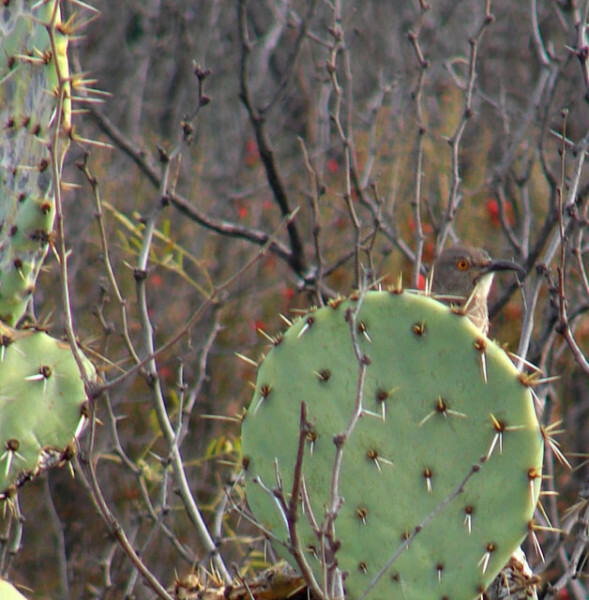 In West Texas, they prefer the "exurban" habitat of farmlands and cemeteries. When snow is on the ground seed eating birds have a hard time finding food, so as soon as the snow begins to melt, they are out wading in the melt water. 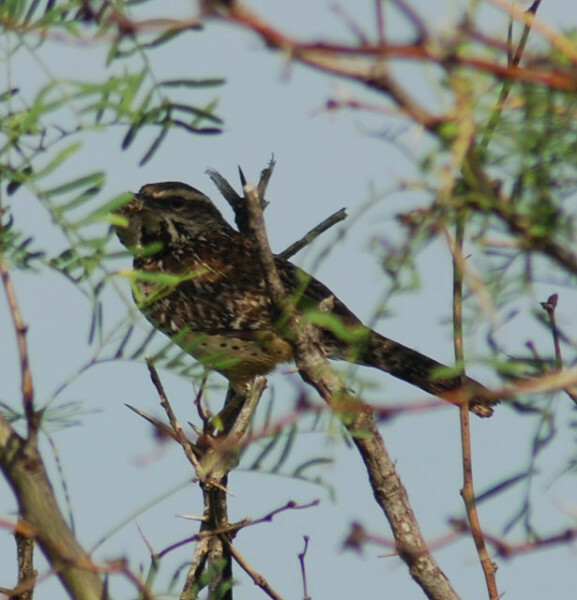 Cactus wrens are birds of the mesquite pasture and are rarely found in town. 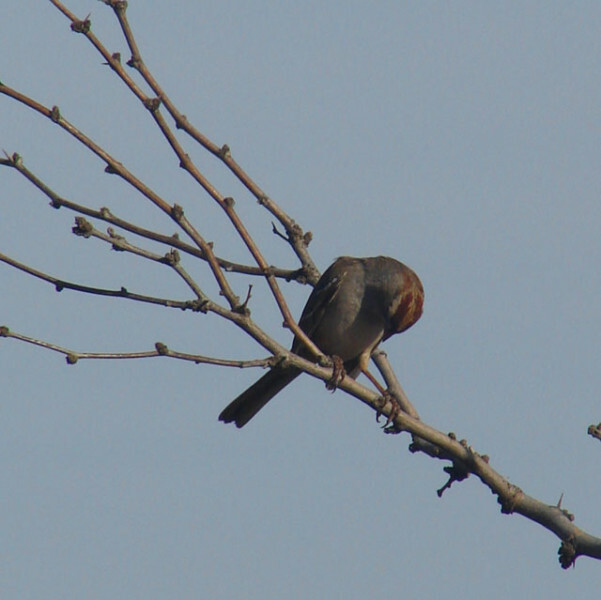 This one preened, scratching its head and digging in its feathers. 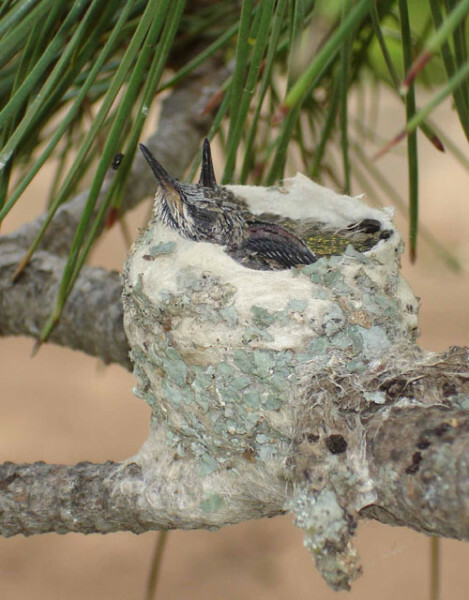 Cactus wrens build big football-shaped nests of grass. 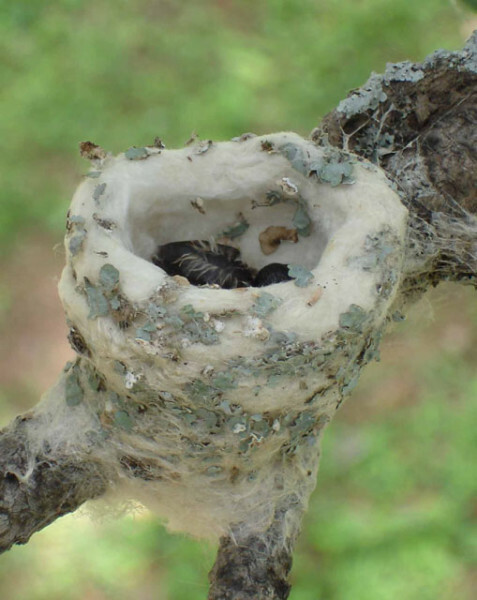 They build nests year around, including winter time sleeping nests. 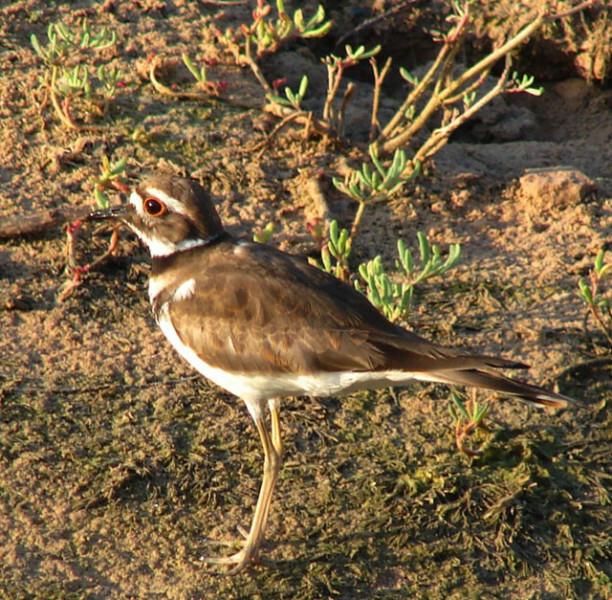 They are often seen carrying nesting material. 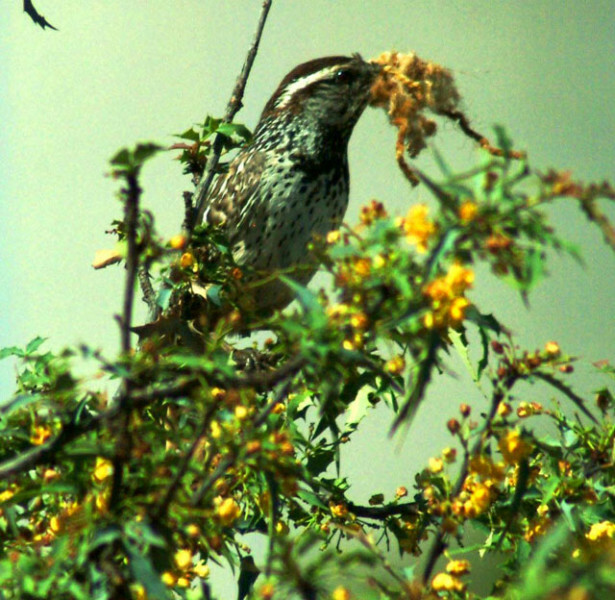 This cactus wren had a moth in its beak and was headed for a nest, but when it noticed the photographer watching it, it tried to hide behind a mesquite leaf. It refused to continue on to its nest as long as the photographer was observing. 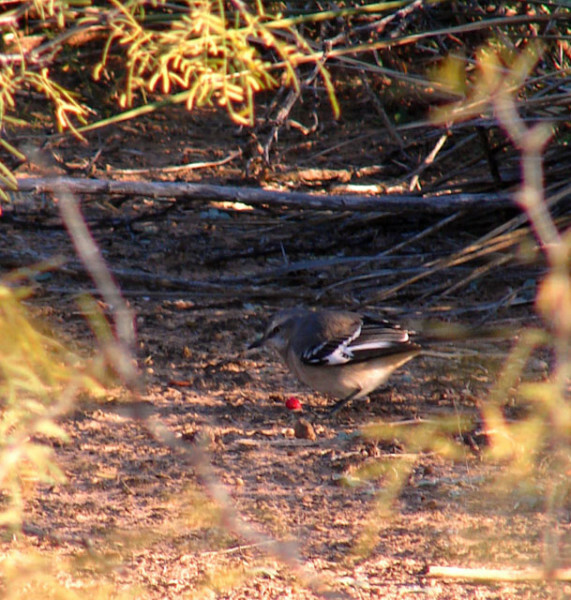 A mockingbird hopped around on the ground looking for food. It found its food - a tasajillo berry - did you notice the berry in the previous picture? 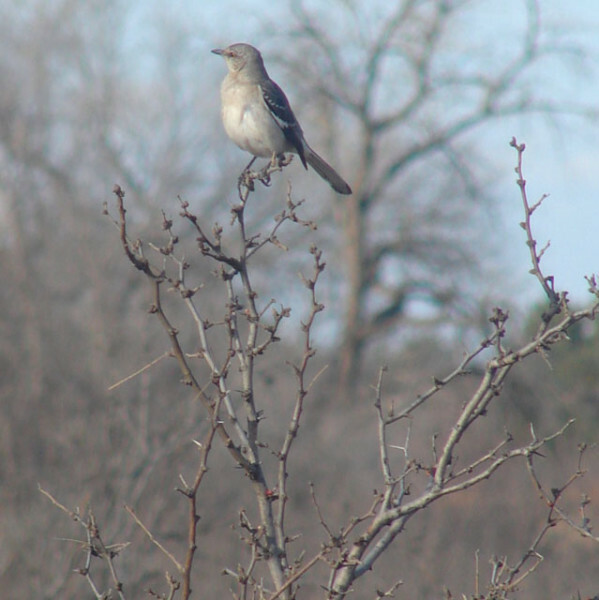 Mockingbirds often perch high in the mesquites. 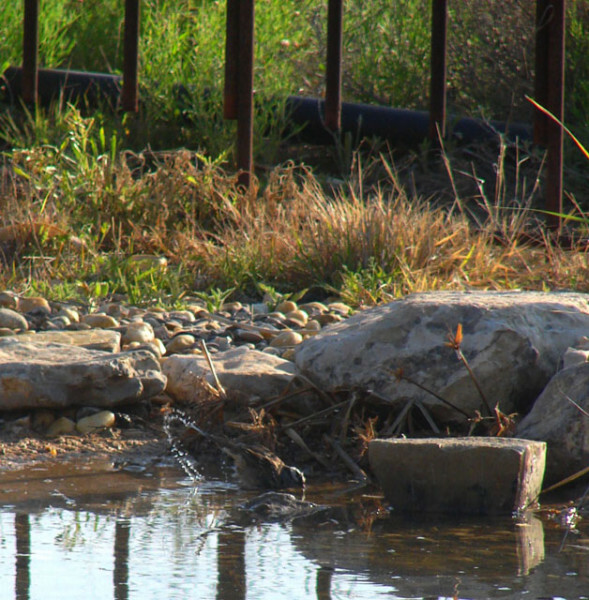 Not all birds will survey their surroundings to look for potential food sources. 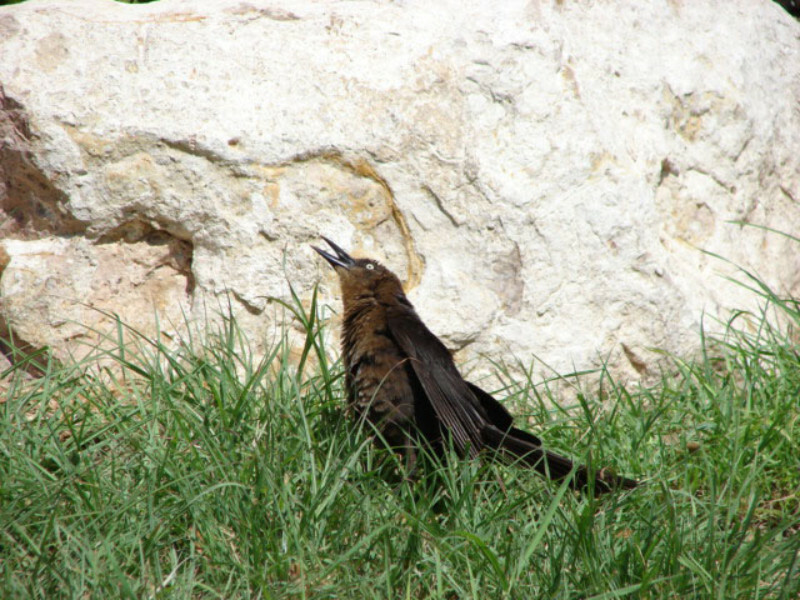 Some species lurk on the ground or in dense vegetation at all times, even when singing to attract a mate. 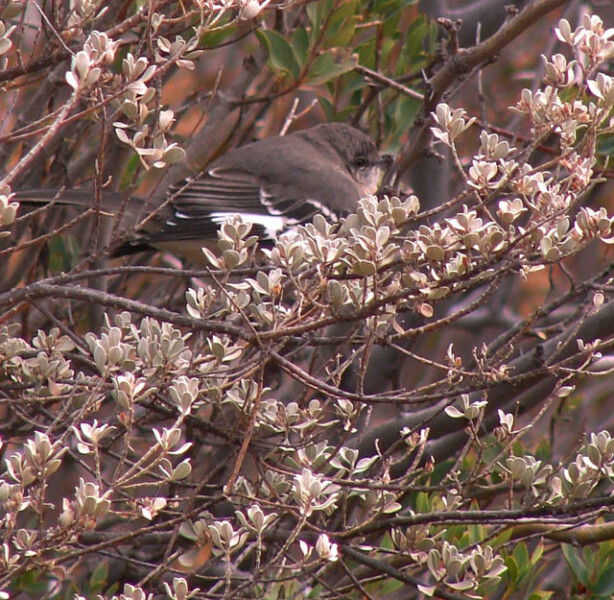 During a cold norther, this mockingbird found the dense leaves of a Texas Sage the perfect spot to get out of the wind. 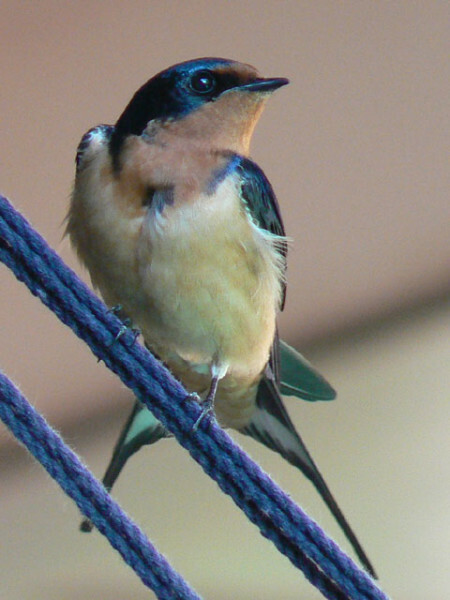 Barn swallows sometimes nest on porches of houses and learn to perch even on mobiles that twirl in the wind. Barn swallow nests are cups of dried mud and grass, lined with feathers. In the wild, swallows nest on cliffs. 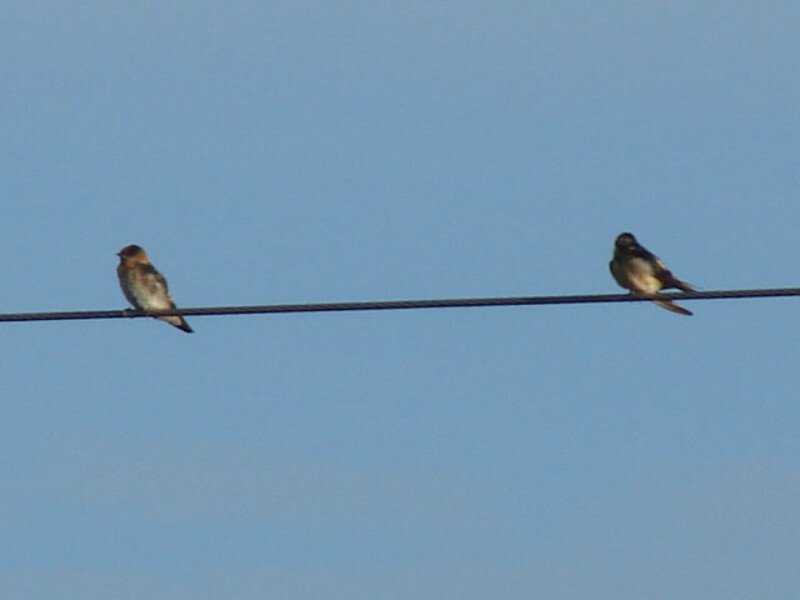 Swallows will perch on electric lines and other cables in between swooping sorties to catch flying insects. 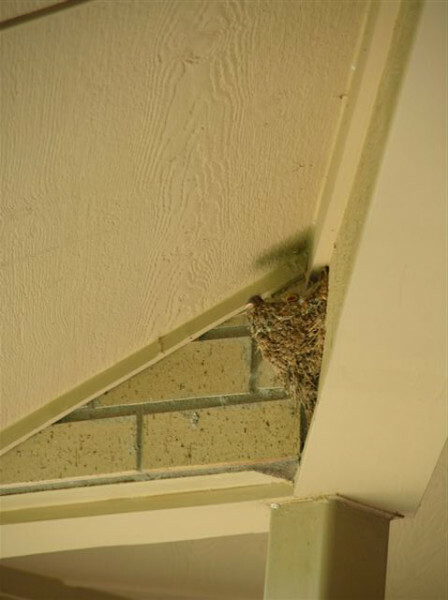 This homeoner did not mind the droppings beneath the nest, for the birds kept the yard free of mosquitos. In migration, swallows will sleep on electric lines and then wait for the sun to come up and warm them before they continue on. 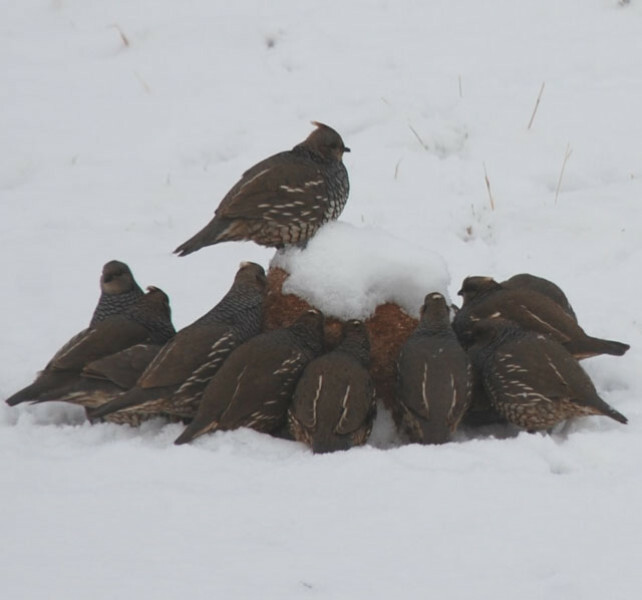 Some rural residents feed their Scaled Quail with "quail blocks." In a snow storm, it is the only food available. 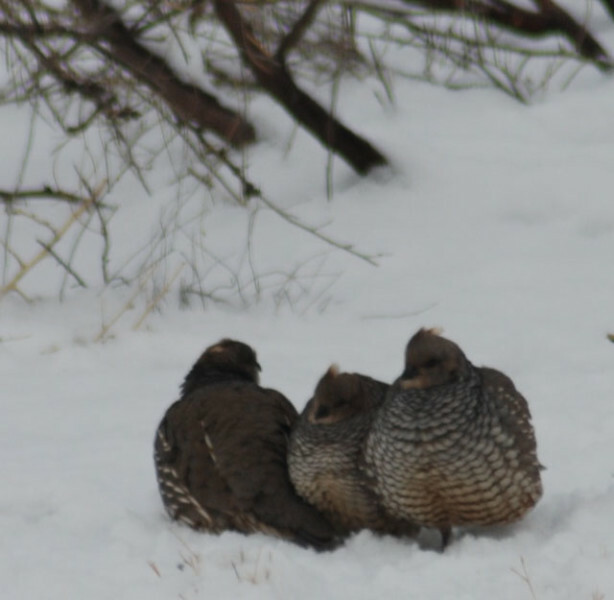 As long as it is cold, the quail will huddle together as much and as often as possible. This group was waiting to go to the quail block. 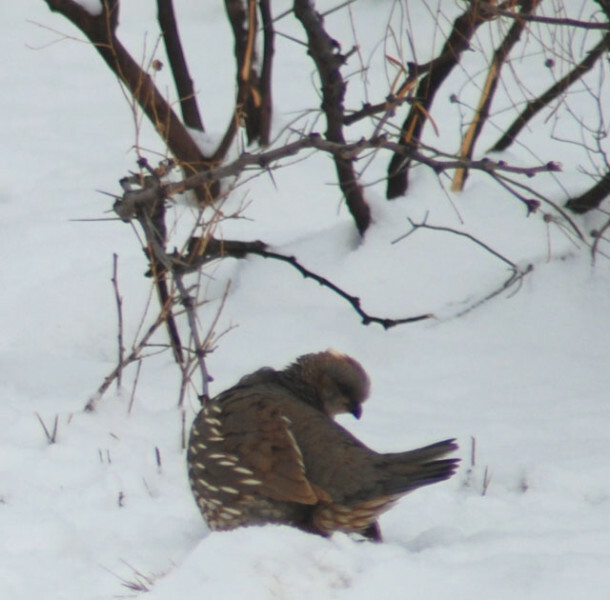 Preening is important in the cold. 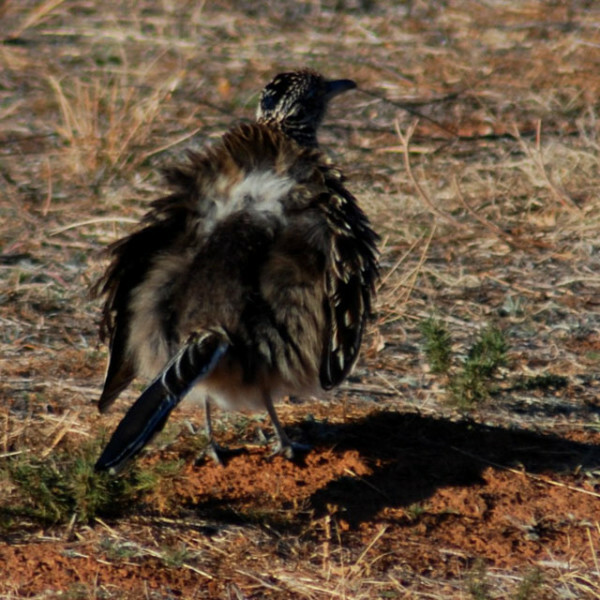 This quail went off by itself and shook itself and worked on a few feathers. 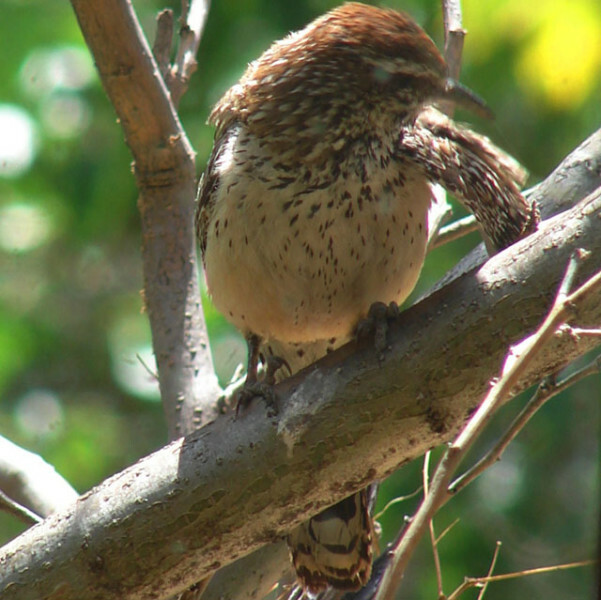 Quail normally stay on the ground, but one bird out of a covey will often find a perch to watch out for approaching hawks, their major predator. 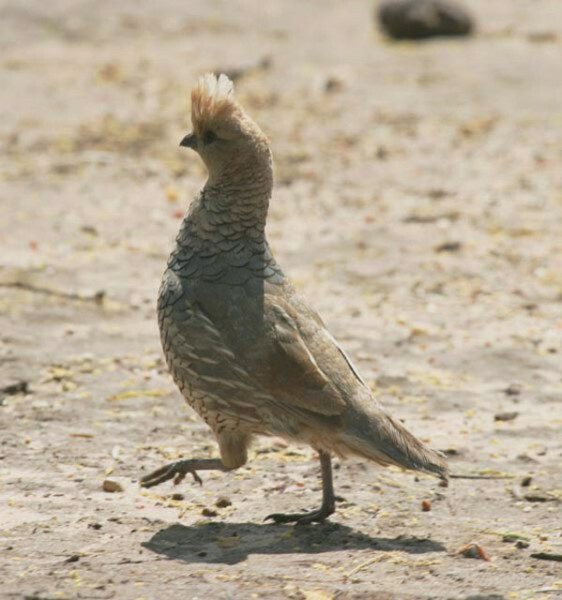 Scaled quail run upright over the ground. When a mammalian predator approaches they run as soon as the predator is spotted, and will only fly if surprised. 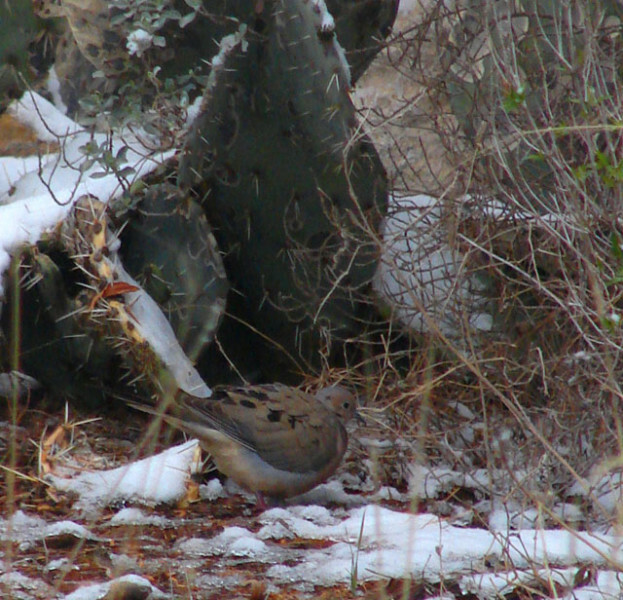 Bobwhite quail sometimes feed with scaled quail. 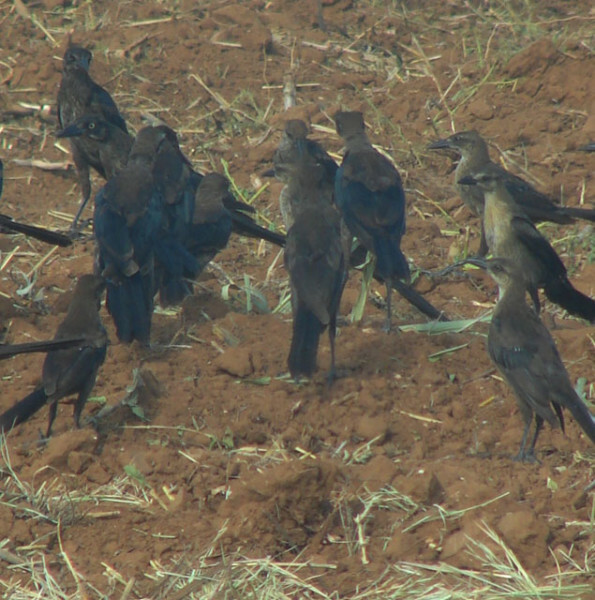 They stay hunched over, relying on the other birds to warn them of a predator. 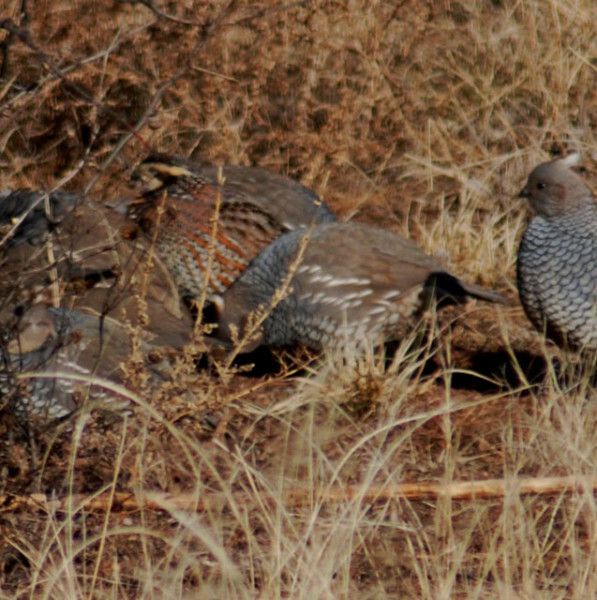 The scaled quail kept standing up and looking around, but the bobwhite never did. 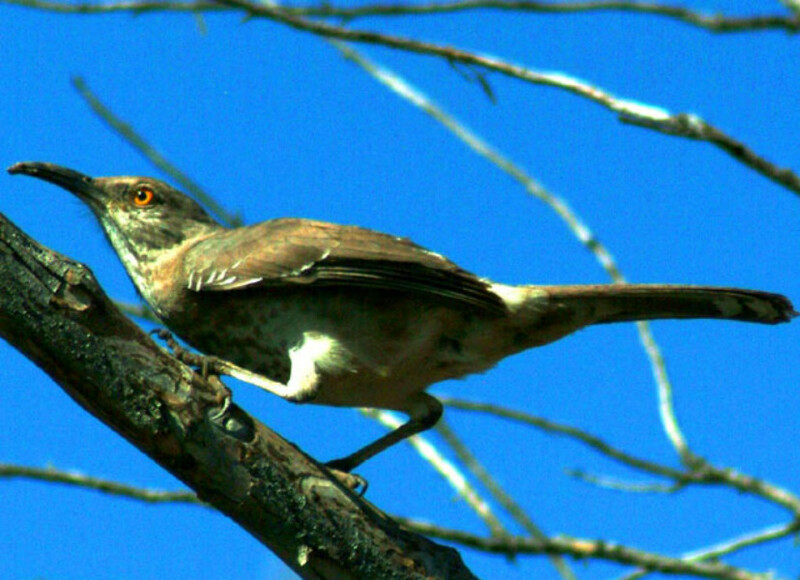 Curved-bill thrashers are also fond of tasajillo berries and defend a specimen loaded with fruit from other birds (like mockingbirds) but allow their mate to feed with them. 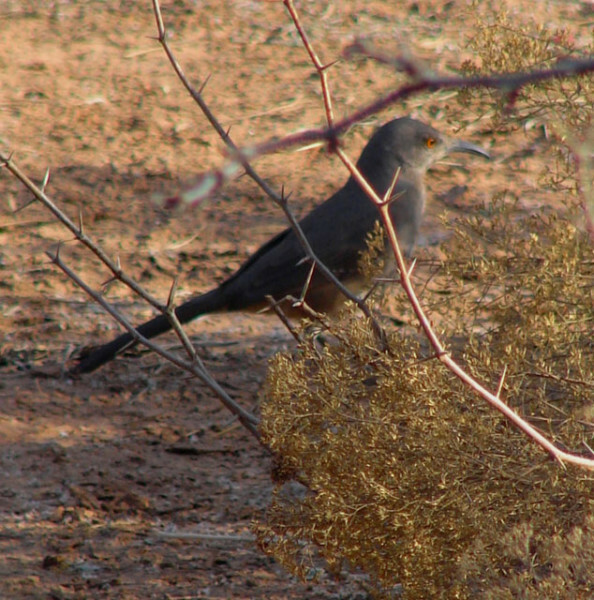 When a thrasher is disturbed, it often drops to the ground and runs to hide behind a mesquite. 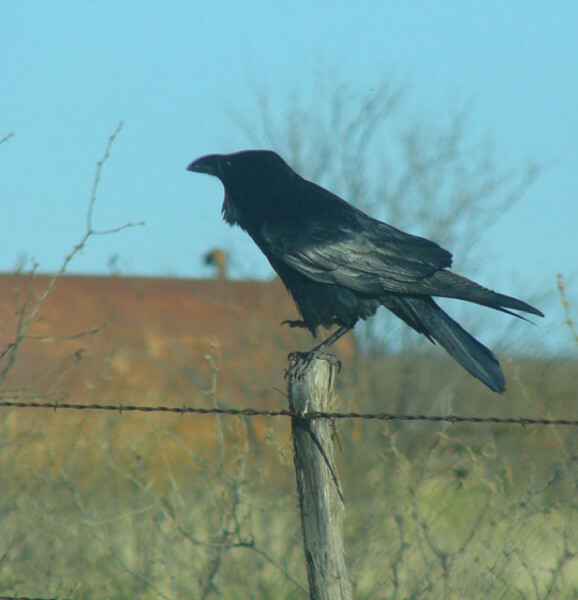 Thrashers are the sentinels of the mesquite pasture. 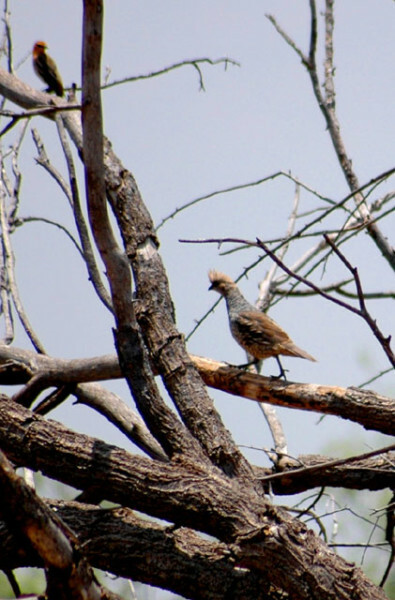 When a predator approach they get high in a mesquite or other brush and begin calling "Taxi!Taxi!" warning every bird and animal that something dangerous is nearby. 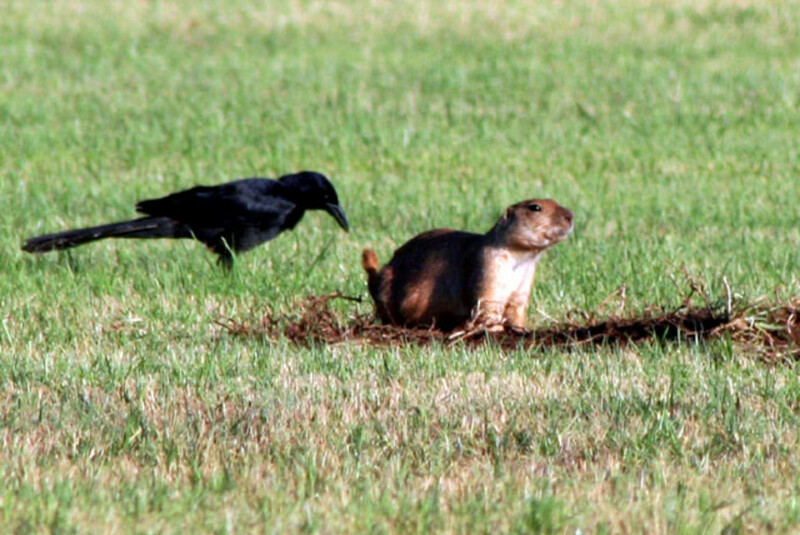 Thrashers can get cocky, and if a person does not appear to be a threat, the bird will seem to ignore the observer. 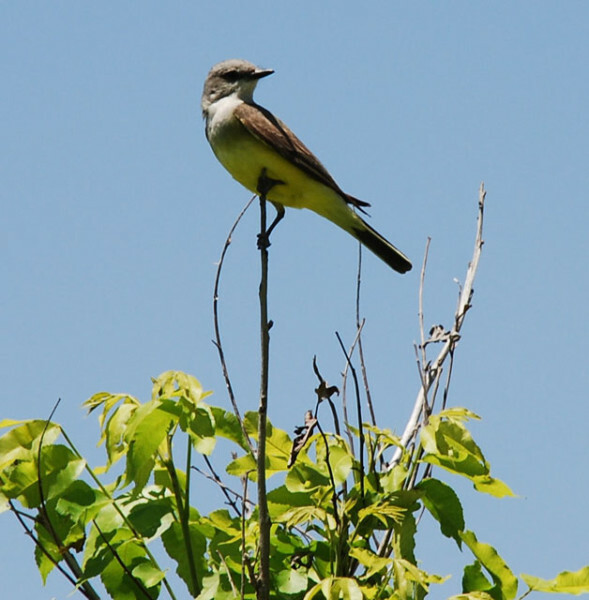 Western kingbirds are flycatchers, and usually find a dead twig high in a tree to perch and watch for passing dragonflies or flying grasshoppers, or other flying insects. 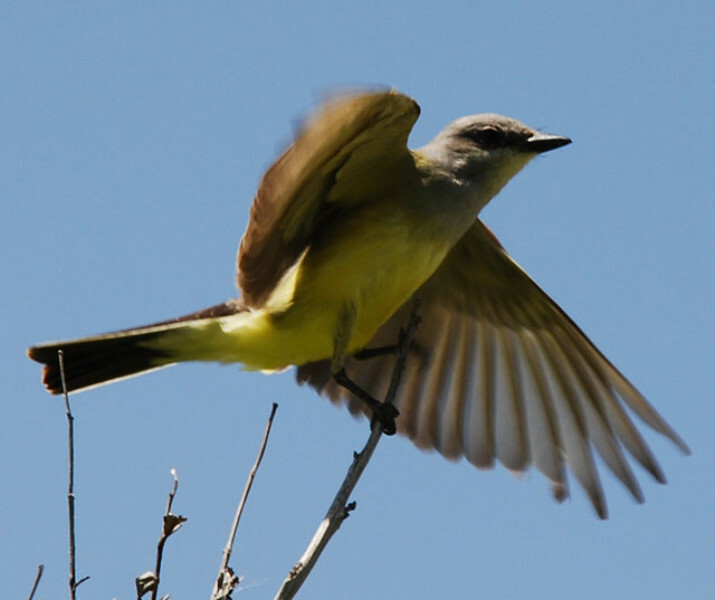 Kingbirds often seem to play - hovering against the wind, chasing each other and hollering. They seem to "love" performing aerial acrobatics. 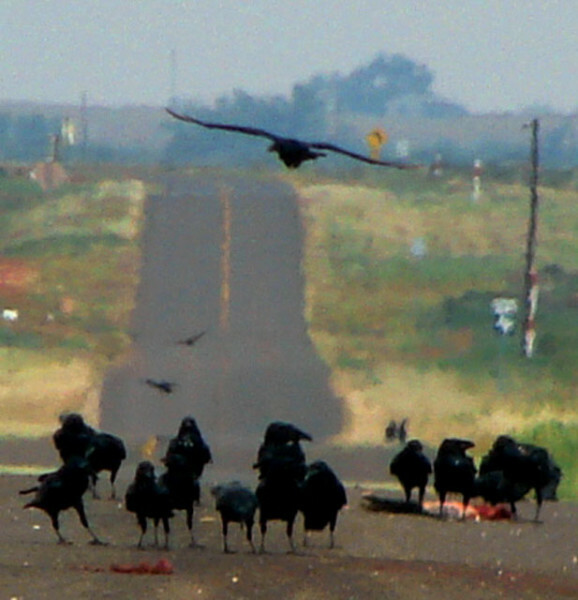 Chihuahuan ravens often scavenge roadkill. 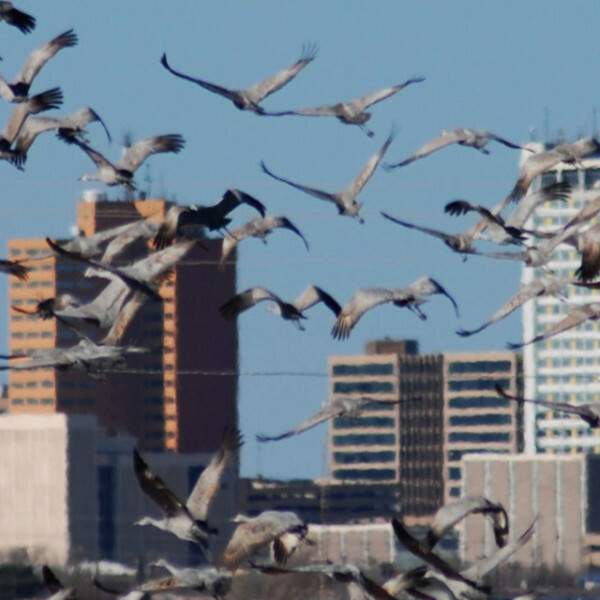 In the winter the species will form big nighttime roosts and then disperse during the day. If a dead deer is located, they recongregate - but just how does the word reach the dispersed individuals. Is the sound of their rough croaks audible over long distances to them. During the growing season, the male wanders around, looking for food. 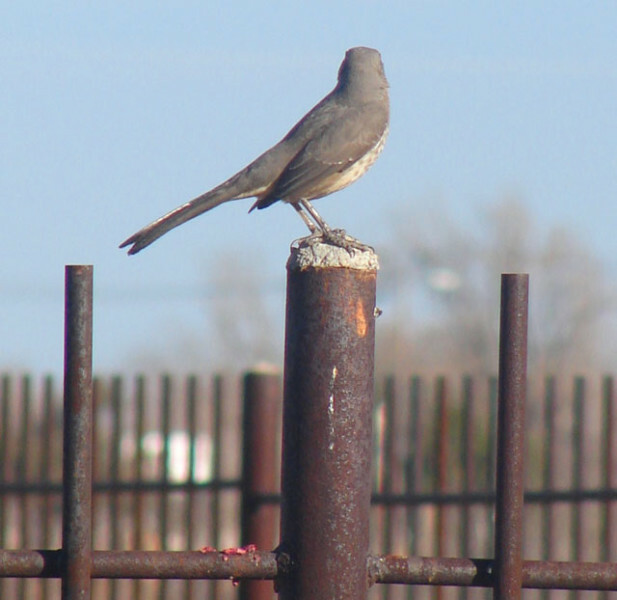 Usually within a mile or two, the female will be on a nest -usually on the crossbars of a telephone pole, or in a isolated hackberry among the mesquite. 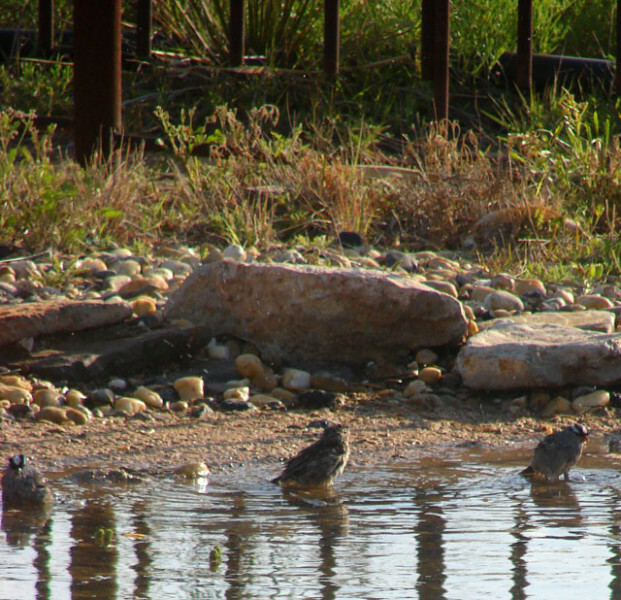 Before storms, cold weather, or before migrating many species of birds will bathe as part of their preening routine. 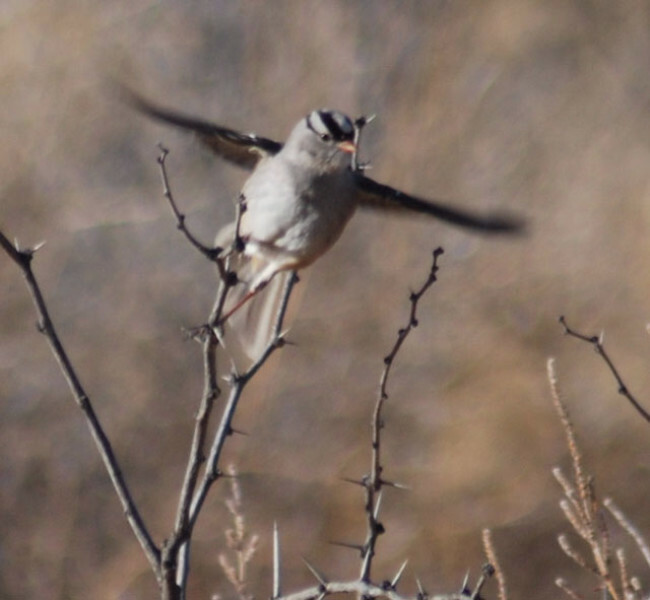 White crowned sparrows spend the winter in West Texas. First, they examine the water. 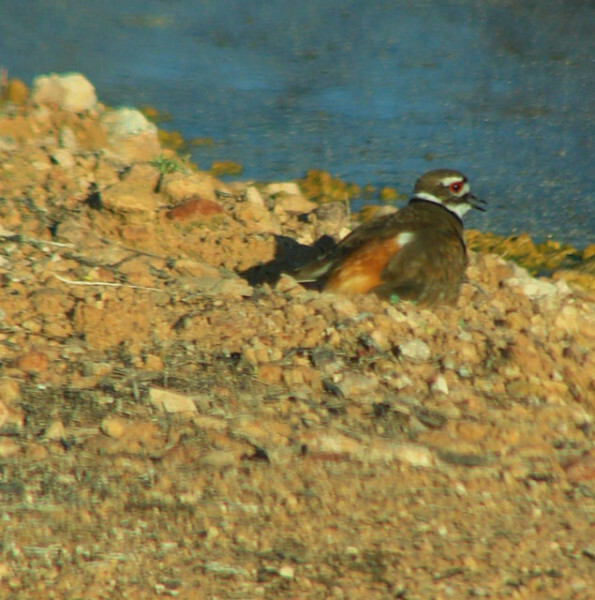 Sometimes they fly directly from the water to a perch where they will dry off and continue preening. Sometimes they are so engrossed in preening they fail to watch for a predator. 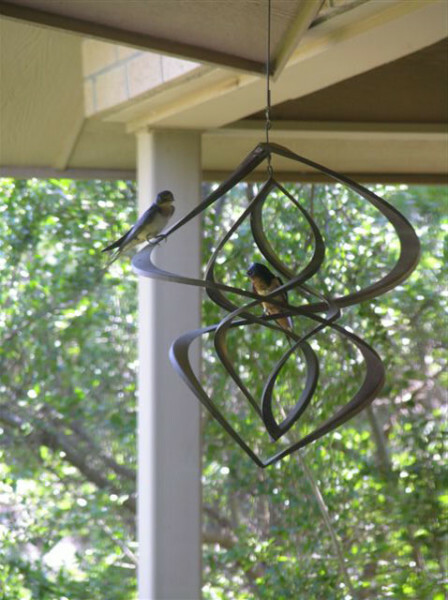 When they take off, their feet hang on the branch until the first downstroke of the flap launches them. 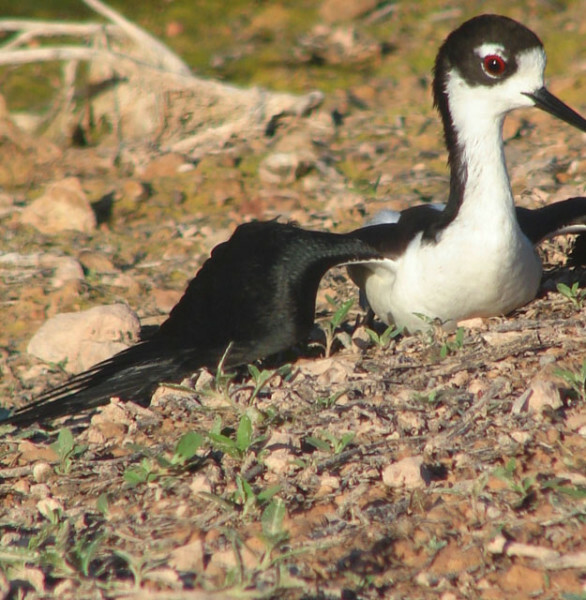 When a person walks into an area where black necked stilts are nesting, the birds fly around the intruder, screeching and swooping at the invader. 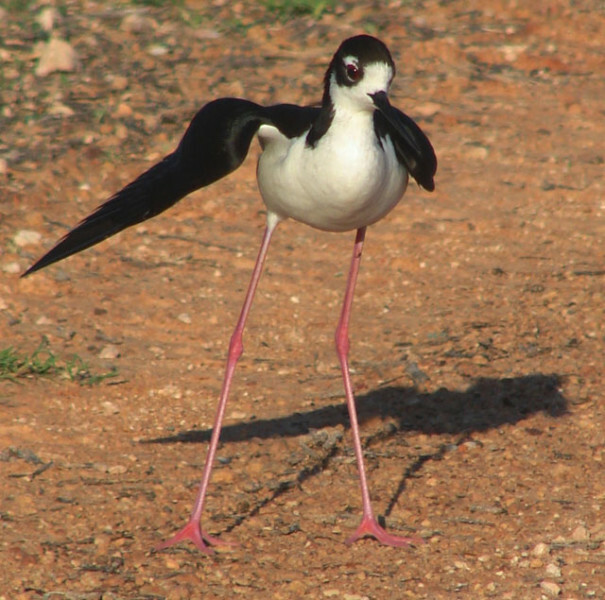 If the observer stays still, the stilt approaches the intruder. 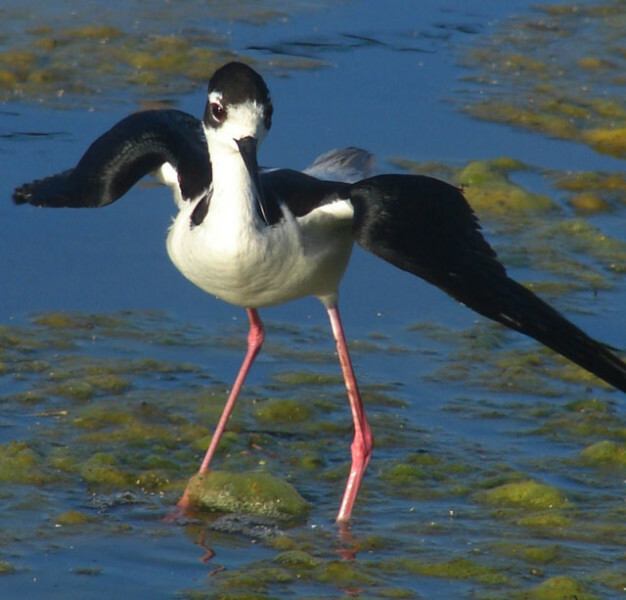 In attempt to fool the observer/predator, the stilt pretends to have a broken wing. 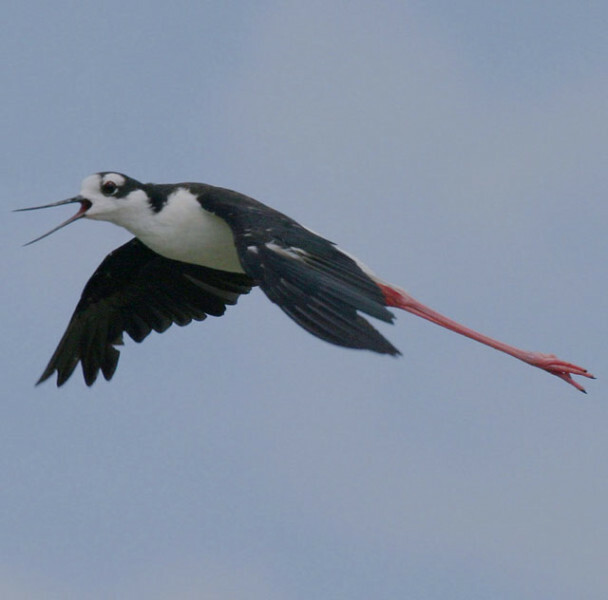 It drives a stilt crazy for an observer do nothing. Its mate is on its nest, and a little bit nervous, for it half-raises off the nest. The mate came very close to the observer - tempting the observer to attack. 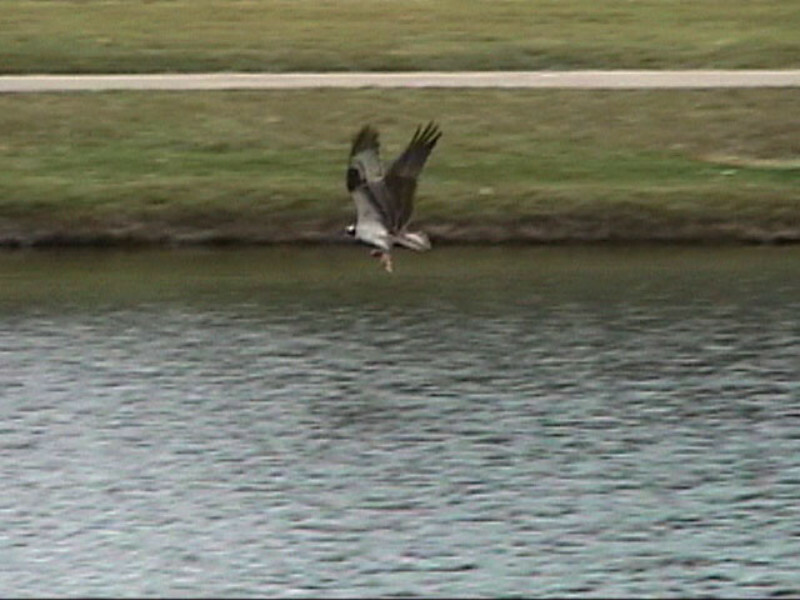 At the Wadley Barron park near downtown Midland, an Osprey swooped into the water and caught a fish. It carried the fish several blocks away to eat it on top of an abandoned parking garage. Ospreys usually only visit the region in the fall. 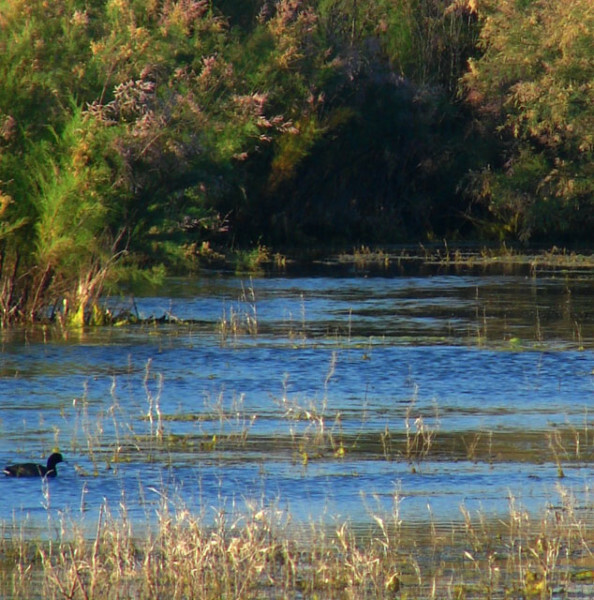 A greathorned owl was startled from this bluewinged teal just after it struck the duck. 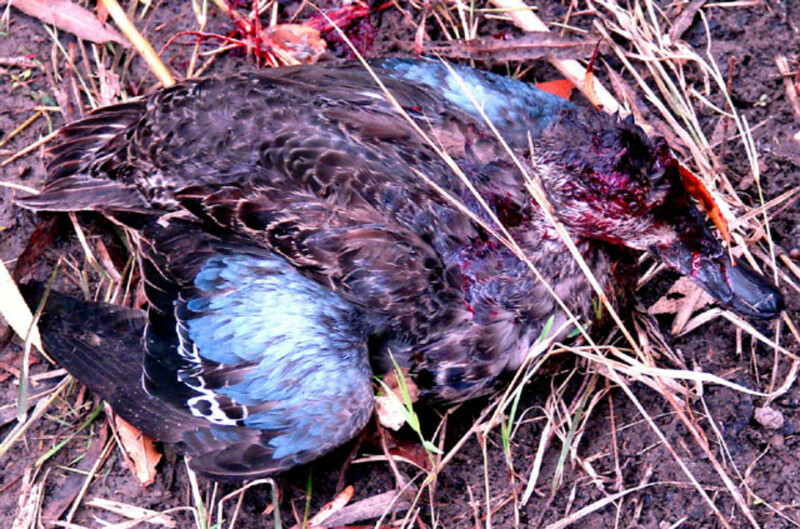 The duck was still breathing. Ladderbacked woodpeckers live here year around. Notice where it has knocked part of the yucca stalk loose while digging for larval insects. 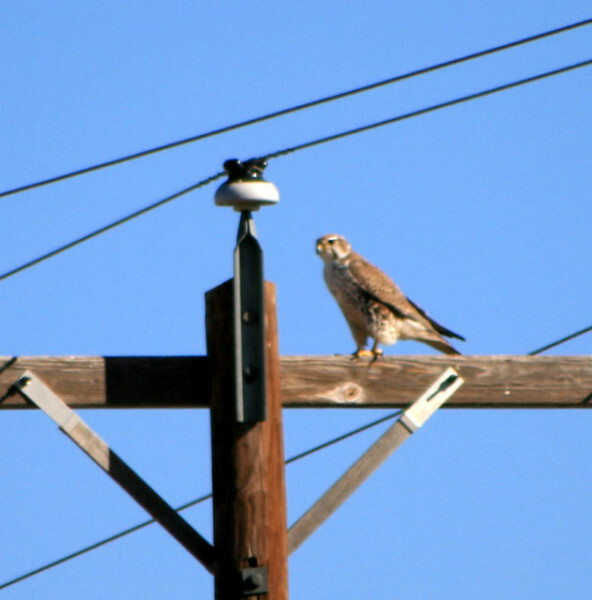 Kestrels, like this one, golden eagles, ravens and many other species hawks use the telephone poles for perches and nighttime roosts throughout the year. 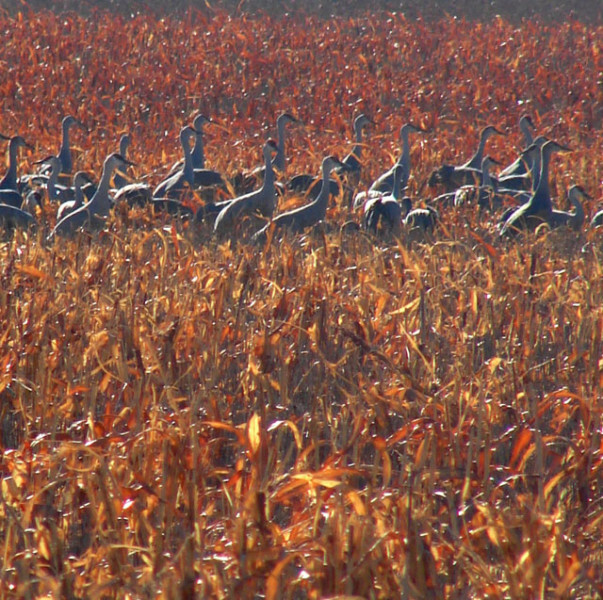 Sandhill cranes spend the winter in farming country in West Texas. They often are seen flying over town and the rural areas. 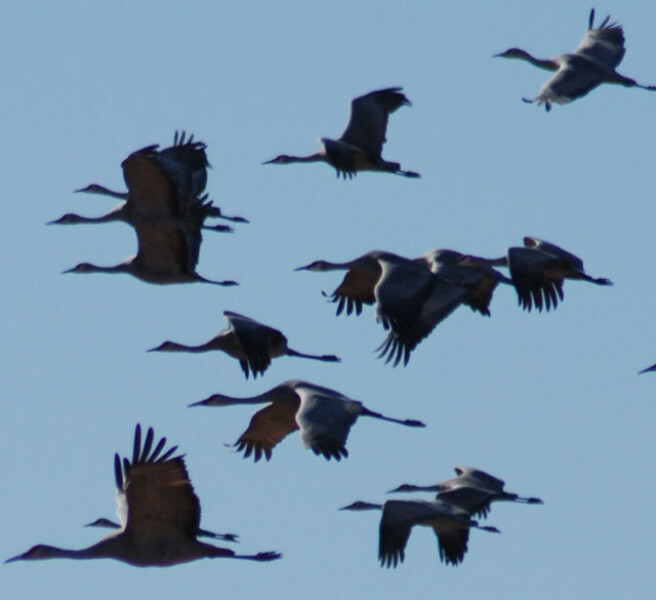 The cranes are most easily found in farm fields during the day, but they spend the night sleeping in salt playas full of water. 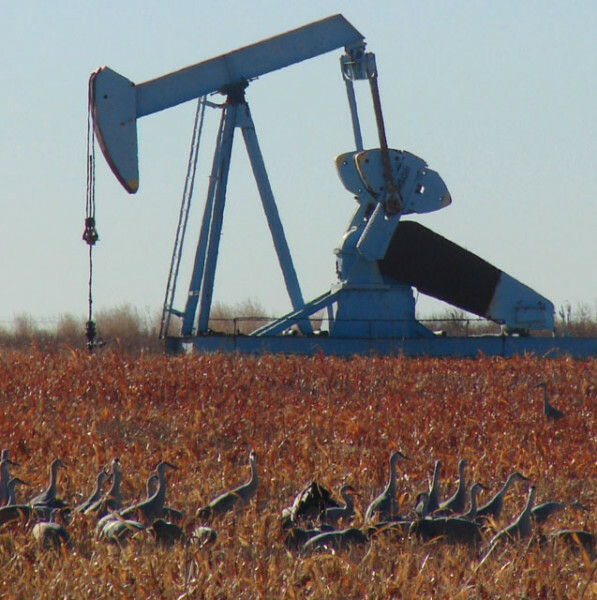 The cranes ignore the oilfield pumpjacks. Big cranes against a city skyline seems an anomaly, but is normal in Midland! 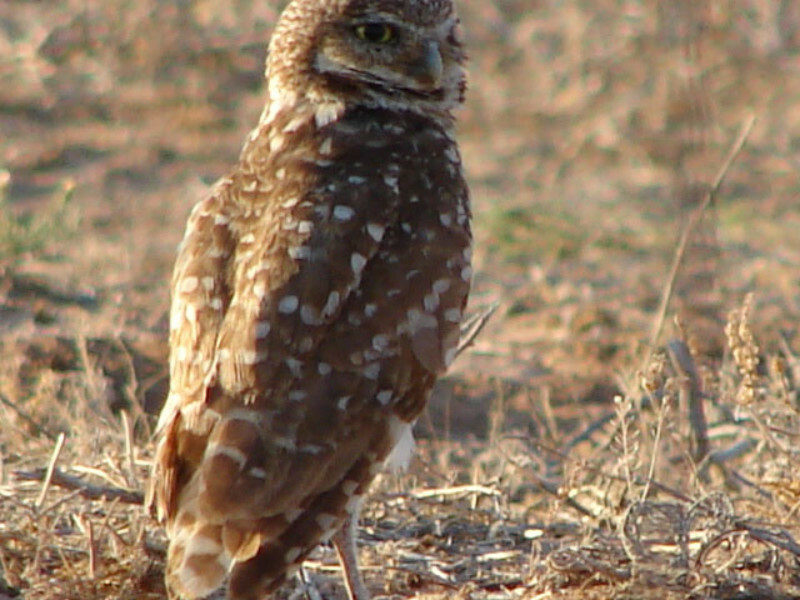 Burrowing owls live in prairie dog towns and come above ground as the sun is going down. 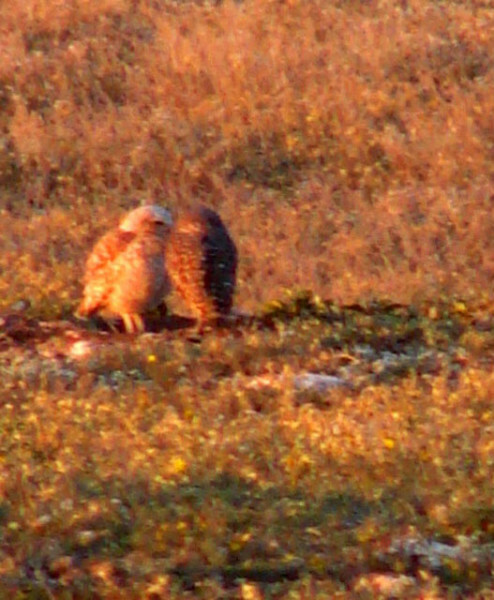 The owl on the left is leucanistic - a partial albino. Despite being very visible to predators, it lived in the "tank farm" (where dozens of big oil storage tanks are) for several years. 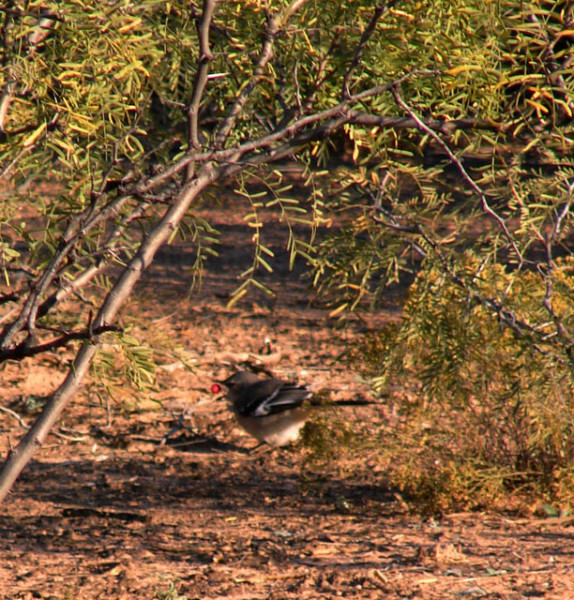 Bewick's wrens are one of the few birds that nest in a hole in West Texas. 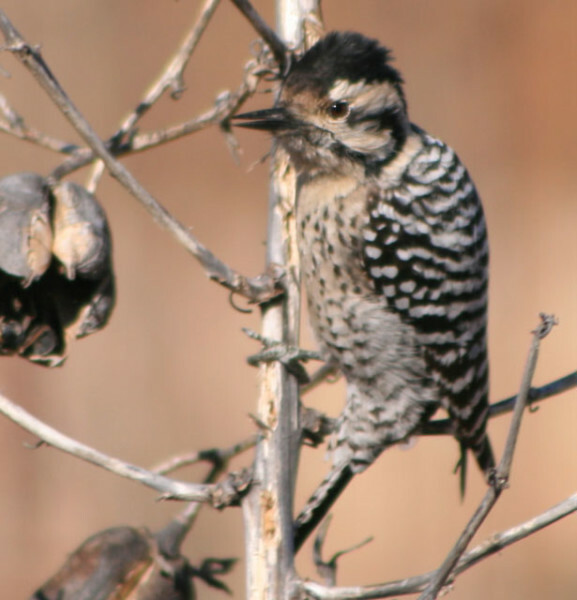 Ladderback woodpeckers and purple martins are the other species that nest in a hole.